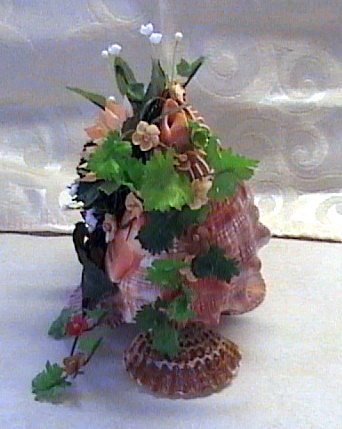 Rosebuds and Seashells, Sailor's Valentines and Seashell Flowers | Sailor's Valentines, Seashell flowers, Seashell Arts, Crafts. Seashell art gallery. A Sailor's Valentine in the Making. 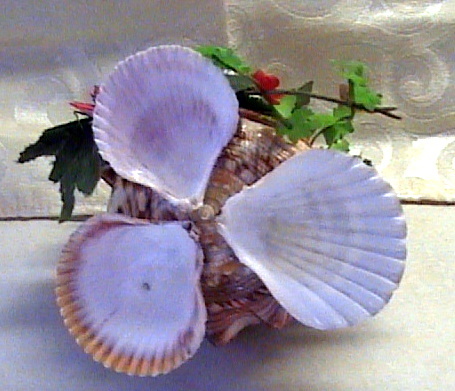 Since starting, I've completed and posted about four Valentines.I also create shell flower art. There are a variety of designs I've completed. With each project, I try to take pictures and briefly explain my steps. I have these odd-looking delphinula shells. The interior is beautifully iridescent, totally opposite from the exterior which is brownish and bumpy. Delphinula shells are so ugly they’re cute. They’ve grown on me and I’ve come to appreciate their unique beauty. So I had this crazy idea for a floral arrangement using them. I kept moving them around until the vision ‘blossomed’, so to speak. 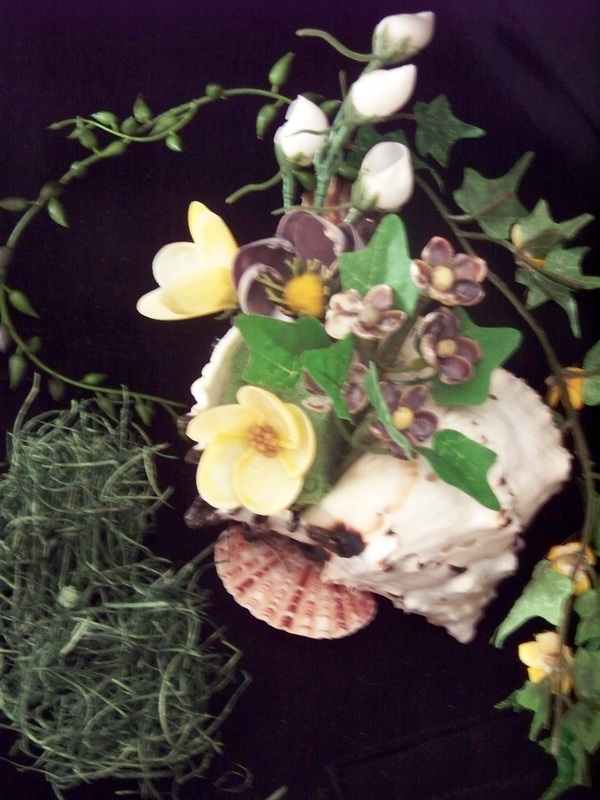 For wall hanging floral designs I have scallops, large pectins, and Irish Baking Scallops. No, I never cooked in mine, but I thought what a great way to showcase the delphinula. 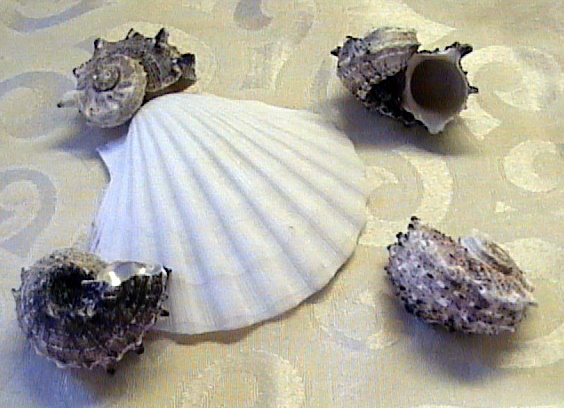 The scallop is pure white and fairly sleek. A total contrast to the Delphinula. Together, in my mind, they make magic. A shell with more color would be too busy for the Delphinula. I want the trio of mini vases to stand out. 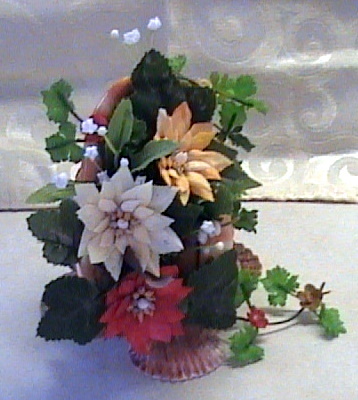 Since the actual vase area will be rather small, the flowers must be tiny and delicate. I’ve selected cup shells in a variety of colors. Tiny tea roses will compliment the vases. My choice will narrow down as I make the flowers. I’m leaning towards the yellows, white, and maybe blue for a pop of color. The purple wings come in shades ranging from creams to deep purple. I only want cream shells for a vine. I dislike glue showing and the vine is the perfect cover up. My rose leaves seem large when I look at them in the picture. Hopefully, that is just an illusion. I picked the smallest ones in my stock. 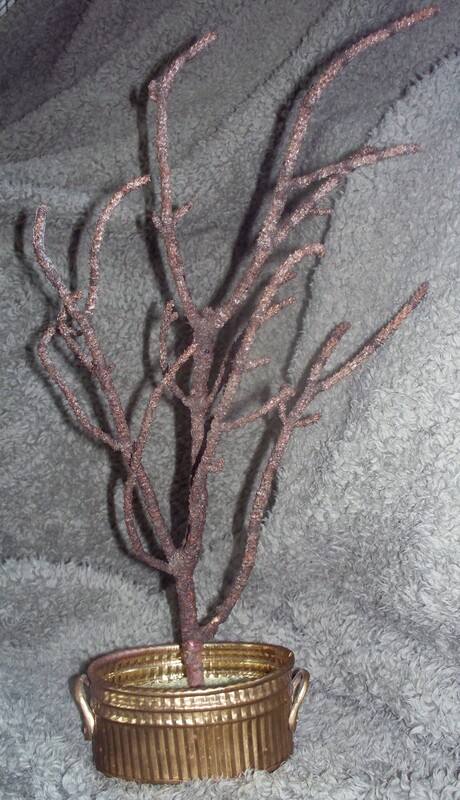 There is also a seaweed type artificial greenery that I’ll be using. I’m still debating on the tiny white silk flowers. 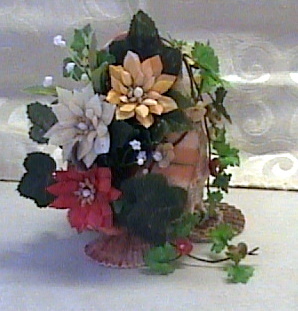 My wood potpourri is back on the planning block as well as a large dried leaf or seed pod. It looks almost like wood and seems perfect for this design. The scallop didn’t sit level so my first obstacle was to find a solution. My leafy looking thing! When I slipped the edge of it under the scallop hinge, the shell sat perfectly level. Suddenly I knew in what direction I wanted this arrangement to go. I slipped one delphinula into the wood loop and balanced it in place. Holding the other two about where I thought they should, I became eager to start. 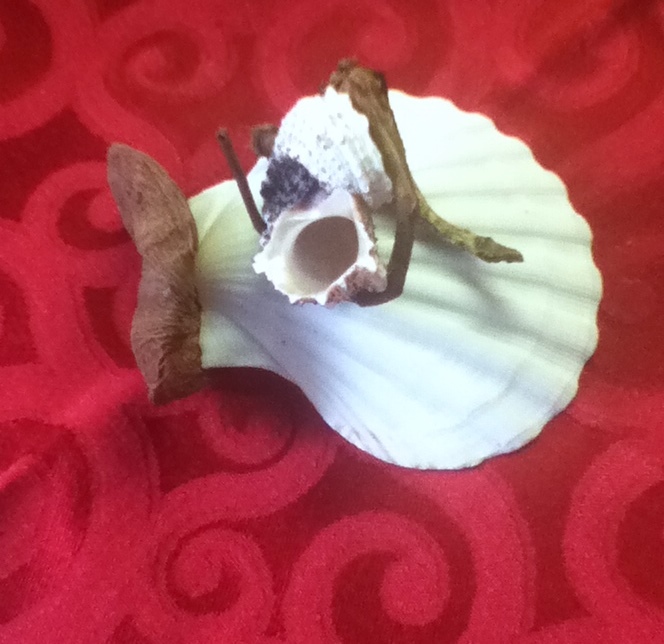 Using hot glue, I attached the potpourri pieces and shells where I wanted them. I want the hot glue to cure for a couple of hours before I start prepping the shells with oasis. Hot glue is supposed to dry fast but I like to let cure a little before handling the piece. I also want to spray polyurethane on the shells before I start. All those lovely shades will come to life. That was a step I was supposed to do before gluing, but goofs happen. They can still be sprayed. Humidity is a factor to consider when spraying a finish. I ignored the 98% humidity level and hours later, the shells are still sticky as hell. But it’s okay. I still have flowers to construct. I won’t attach the vine until the end so that I won’t damage the delicate flowers. 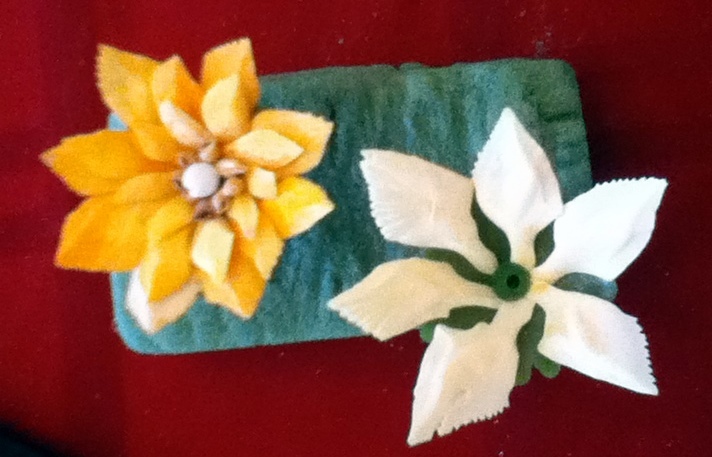 However, I decided to make them the first flowers I finished. They are the simplest to make and they become the goal I work toward. When it’s time to place the vine, I know I am finished. The purple wings have lefts and rights as you can see in the picture. 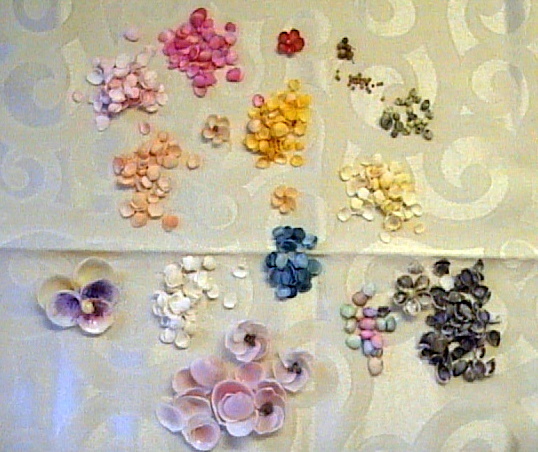 After sorting, I was ready to make the flowers. A simple five petal flower with a yellow littorina as a center seems to be the best idea. 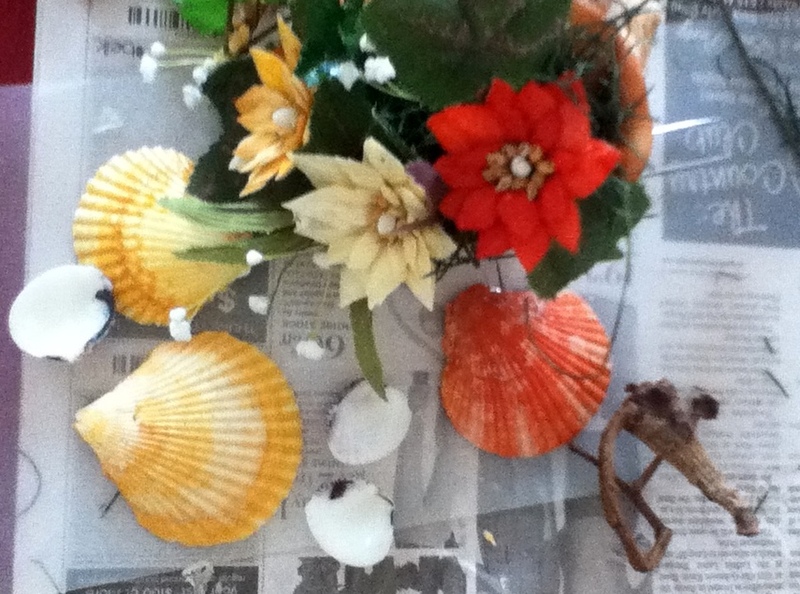 Some shells have a bit of color in them but I think that will help tie them to the color of the delphinula. The interior of the shells are shiny but I may spray polyurethane on them to intensify the color. The cup shells have a matte finish and I am undecided about putting a finish on them. I tried multiple times to find a way to support the three pectins. Not only was I unsuccessful, I managed to break the glue bond! Very frustrating. On the upside, I did not damage the arrangement. Then a friend says to me ‘just goes to show the best laid plans’. Thanks, I really needed to hear that one! I could have just scrapped the plan but I have a stubborn streak. Where there is a problem, there is a solution! After I completely removed the pectins, I attempted to place them closer together. Then tried them further apart. I selected three white venus clams to slide between the pectins to act as support. They fit so perfectly that I thought I had my solution. No go. I really liked these shells for the colors. They remind me of sunrises. The reds and yellows are just so cheery. 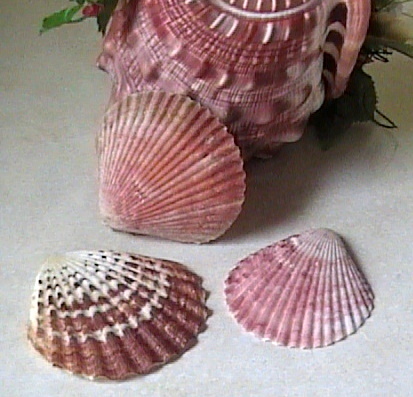 My color scheme was based on these three shells. After searching my stock, I found those were the only ones with those particular colors. I probably have five pounds or more of pectins, scallops, and clams in different sizes. Talk about disappointment! My wood piece I did keep for the next attempt. In an earlier post I mentioned a product for glue removal. 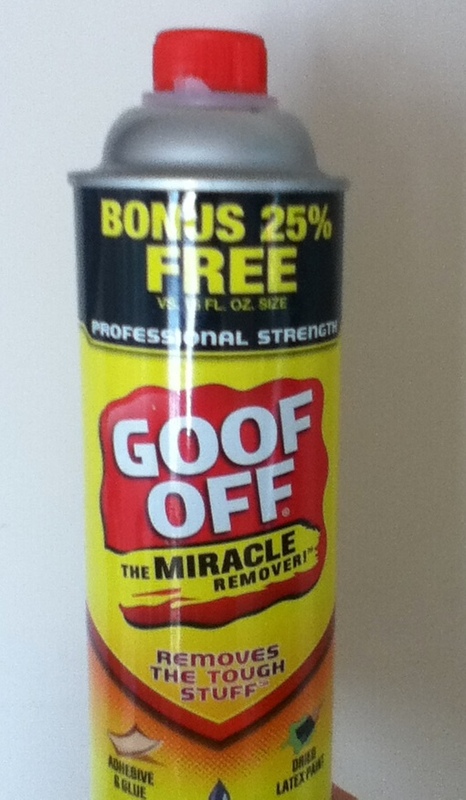 Goof-off is wonderful! No glue adhered to the wood piece. I wasn’t sure how the chemicals would react on the wood so I was glad of that. Use this product in a well ventilated area. (On a side note, when I use this on valentines, I moisten a Q-tip and gently rub it over the excess glue.) After the glue was removed, I washed the shells for use on another project. This product will remove any polyurethane so that will have to be reapplied. I’m attempting to try three different pectins. These shells are flatter and I am able to set them closer to the point of the cameo. 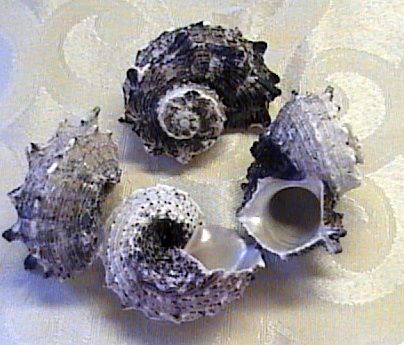 Two of the shells in the picture still have the hinge attached. Using needle-nose pliers, I carefully removed these. It’s easy to snap that part off. I had some concerns about the color match since the new choices are so much subtler than the first. 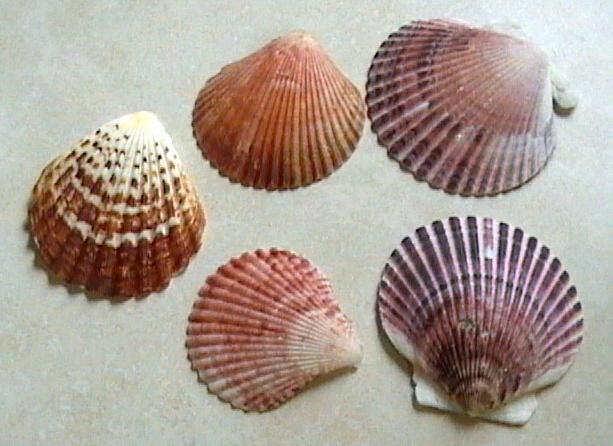 As before, I washed and dried the shells, then sprayed them with polyurethane. The colors did brighten considerably. Truthfully, the pectins match the exterior shades better than my original choice. The interior lip curls over and the interior glossy oranges are exposed. My flowers are still the perfect match in that area. The new pectins are much flatter. With extra shell contact, I’ve been able to create a stronger glue bond. I’ve decided that if the adhesive should weaken, I’ll glue the arrangement to a wooden plaque. That’s tantamount to giving up, I know, but after this, I’m not battling anymore. I always impress myself when I can complete a piece as I had envisioned it. Not that I’m trying to sound vain, just that sometimes I don’t believe I actually created something so beautiful. Well, dang! That’s conceited, too. But I’m sure you know what I mean. I’ve lived my whole life believing I have no artistic talent. Now I find that I with the right medium I can create beauty. I guess that means I need more faith in myself. If you’re like me, then you need to develop faith in yourself. Let your imagination go. I think sometimes we lock ourselves into the ‘I can’t’ mode. 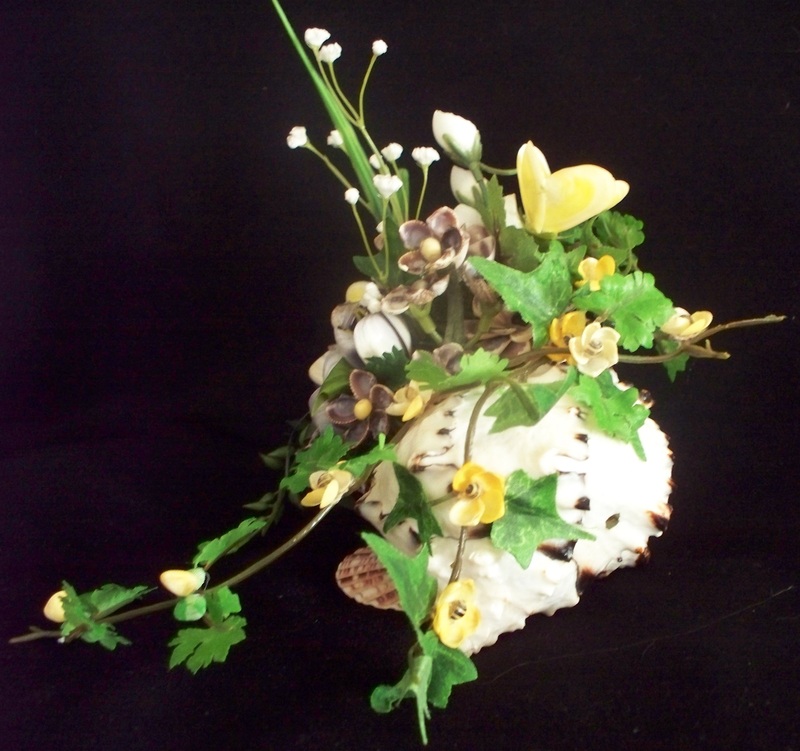 Anyone that can arrange flowers can make seashell flower arrangements. For me, I look at every floral design I can find. This way I can learn about dimensions, proportions, color combos, etc. First, I need to apologize for the quality of the photos. My camera refused to work so I had to rely on the iPod. The pictures are OK, just a little grainy. When you click on them for the enlargement, you can still see what I am describing. Even though the clarity is lacking, I hope it doesn’t distract from what I’m posting. I positioned the three pectins so the base of the cameo rests equally. The darker pectin in the front doesn’t actually touch the base. I added a touch of glue on the lip on the cameo shell where it touches the pectin. 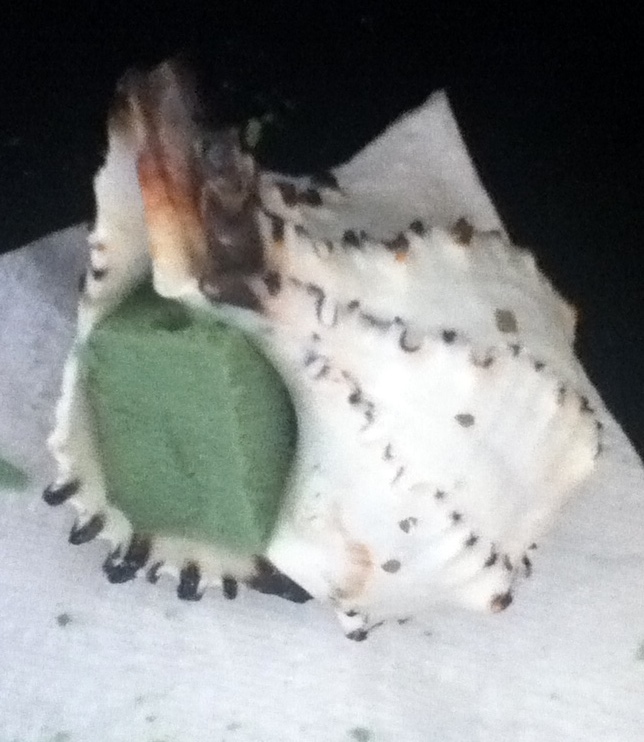 The two shells still didn’t want to adhere, so I glued a piece of potpourri wood between the pectin and cameo. I have a picture of the wood piece further down. The ‘artistic’ placement, I believe, will solve the issue. 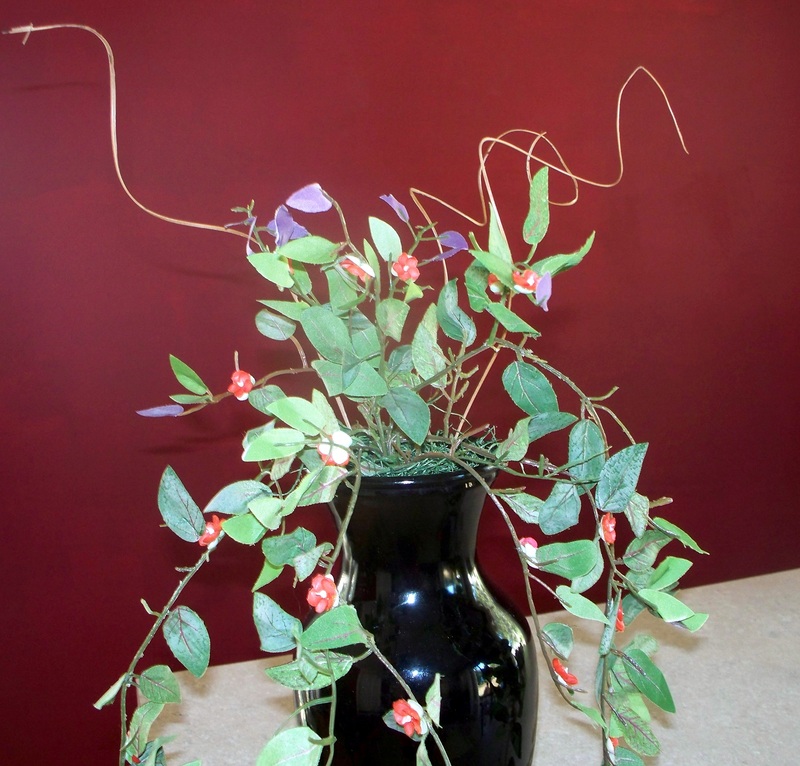 I will also slide the vine through the wood to lend to a more natural appearance. Here you can see the very bottom of the shell placement. I have a few concerns about the strength of the trio. I may need to think about an addition for stability purposes. The problem requires a creative solution. Other than attaching the piece to a wood plaque, I haven’t been able to come up with an alternative. 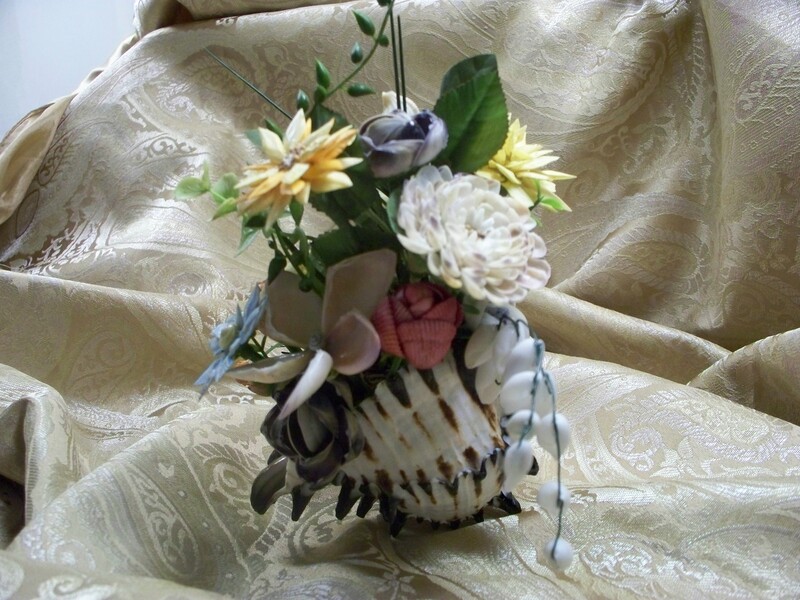 I’ve started with just thirteen cup shell flowers. In nature, some flowering vines do have multiple colors on the vine. With the right placement, I hope they’ll have a realistic look. I was afraid of the sepia shade, at first, but I rather like the look of the brown flower. Placed next to the red scales, they really pop. After putting a floral base on a stem, I stood the wire in oasis. I ran a bead of glue around the center and the top edge of the base. The first row of gar scales was placed fairly evenly around. Another bead of glue was placed around the bottom of the gar scales. I did this not only for the next row, but also for added security of the first row. 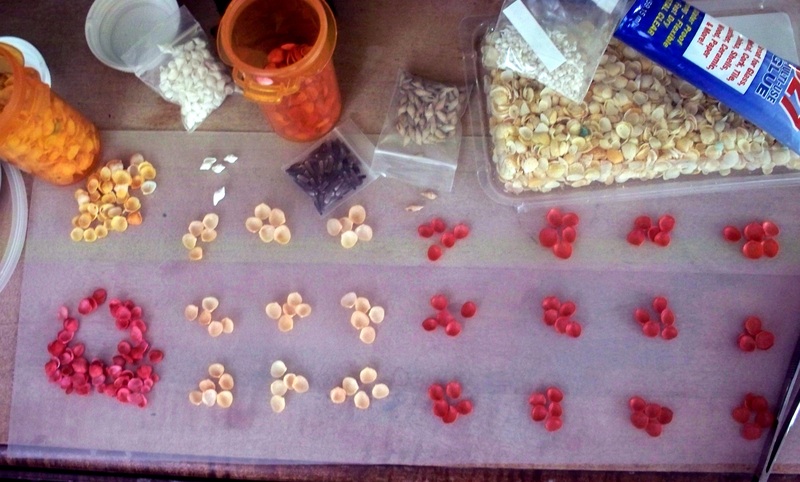 A third row of smaller scales was placed using the same method. A row of tiny, pointed Philippine rice shells was next. 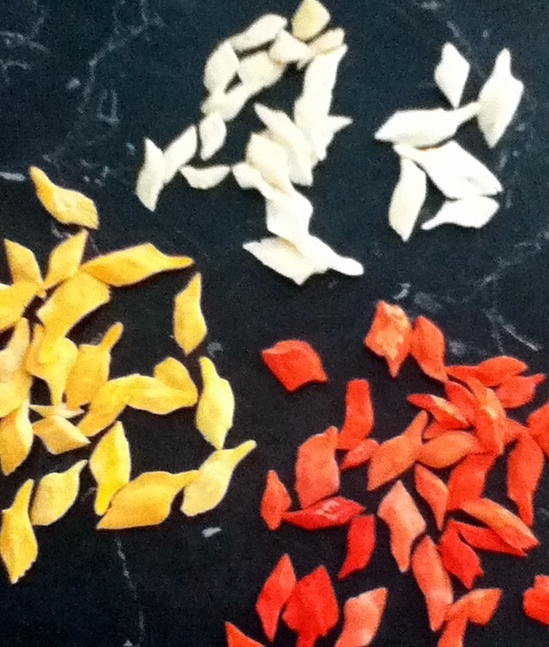 The plan was to place the rice shells as uniformly as I could to simulate new petals. 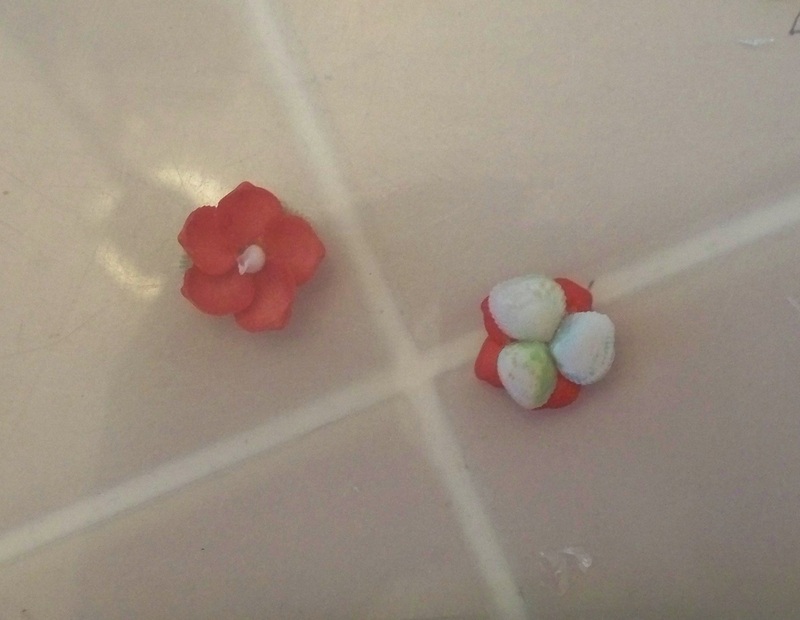 As you can see in the picture on the left, I didn’t pay very close attention to shell placement in the orange flower. The rice shell openings are not facing the same direction. I discovered this after the glue was dry. So much for my powers of observation! The photo on the right is the vine. I started positioning the cup shell vine placement, adjusting it until I was satisfied. Unless you’re using hot glue or an instant glue, this is where patience comes in. Glue has been applied in three different places on the vine but until it dries, I have to wait to make further adjustments. Take your time here. Repairing goofs is time-consuming. Here you can see the wood piece I’m using as shell stability. When I’m finished, I’ll try for better photos. It is actually an interesting little piece and looping the vine through it, anchors it to the design. The shade of brown blends beautifully with the overall color scheme. I like mixing natural items in my arrangements. I wish I could find real greenery then I wouldn’t have to rely on the artificial. The silk works for me, but I would just like to try the real McCoy once. The picture to the left is how I’ve decided I’ve to place the gar scale flowers. Now I’ll slid them back out and add the dried green moss. Since the shell opening is so vertical, I’ll put a few glue blots for security. **I’ll finished this article on the next post. The cameo arrangement needs a little more work. When I was attempting to add supporting shells, the original pectin came off. I hadn’t left the glue cure long enough. It seemed the more I tried fix the shells, the worse it got. Soooo….Back to square one with my design. Right now I have a cameo without support. 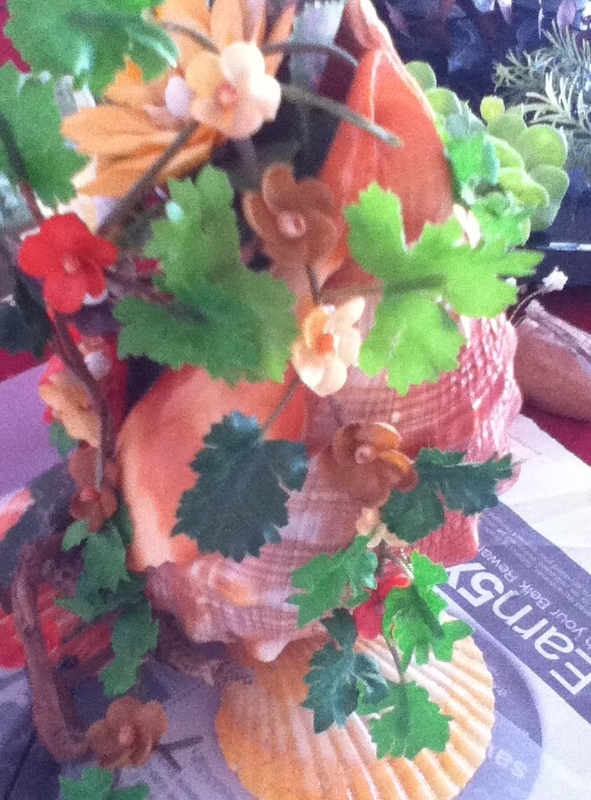 I have this beautiful Cameo shell and I really love the colors. The creamy orange strips of the interior are gorgeous. Browns, creams, and oranges blend into lovely patterns on the exterior. There is a prominent point on the broader end of the shell that prevents the shell from standing upright. To solve that, I picked 3 Noble Pectin shells to form a base. The yellow and orange shades compliment the Cameo perfectly. All three Pectins have natural flaws that add character. I will spray them with polyurethane before gluing them together. Giving the Pectins a sheen will help tie them to the gloss of the Cameo. 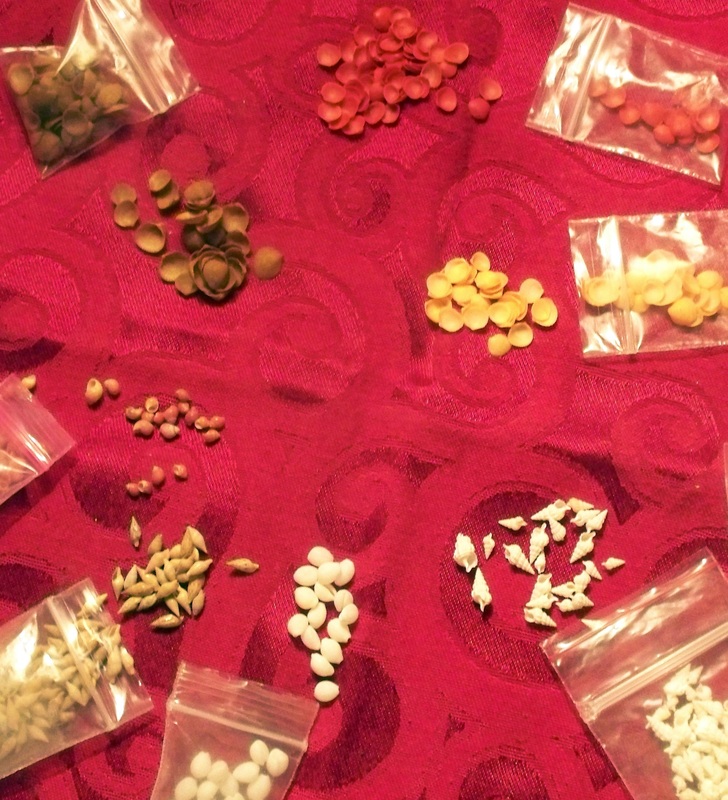 For the primary flowers, I chose gar scales in natural tones, dyed orange and dyed red. I purchased the gar scales in natural tones them dyed them using professional food color. One side of the scale takes color well. The other side dyes well on the edges and the center retains a lighter tone. 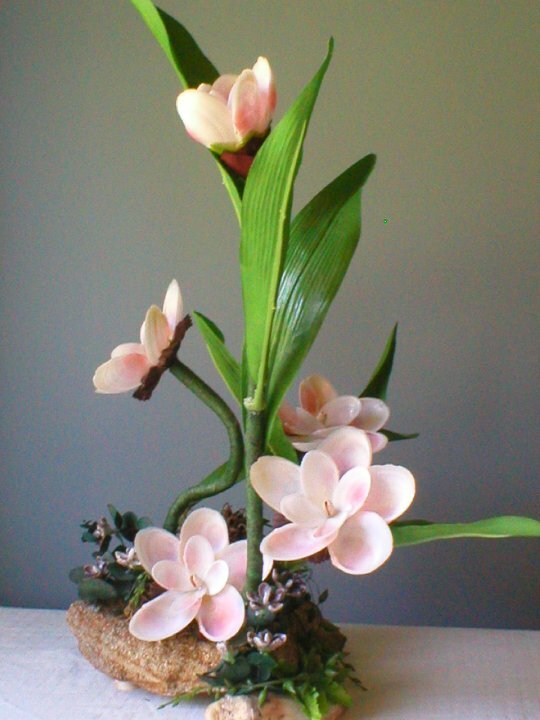 It makes the scale very versatile for flower type. The scales are very solid and the tips are incredibly sharp. The camera doesn’t pick up the actual colors of the gar scales. But they are a creamy off-white, tangerine orange, and dark red. The colors play off the Cameo quite well. Hopefully when it is finished, I get better lighting. 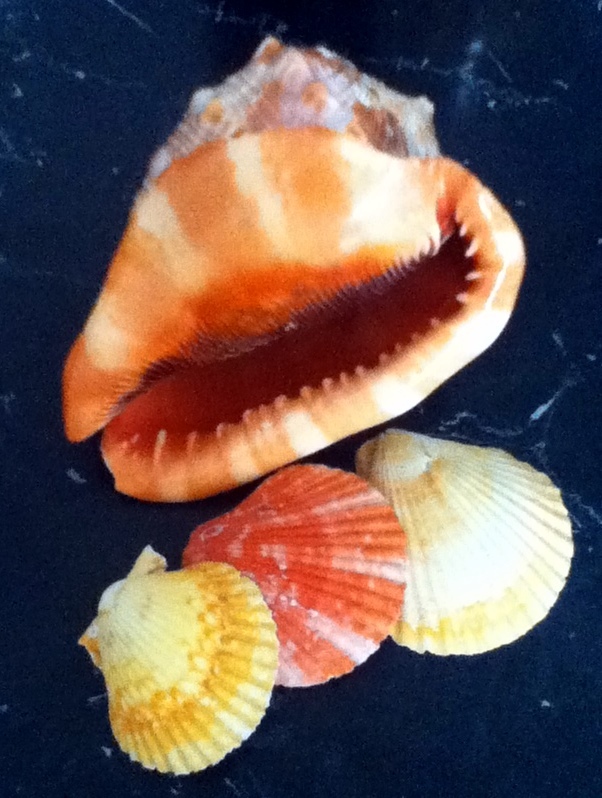 The dyed cup shells I am using are sepia, red and orange. I’ll use a vine for their placement. 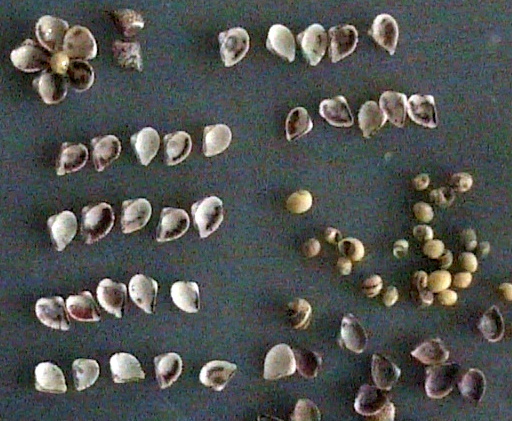 In the picture, you’ll see white trivia, mini orange snail shells, white mini augers, and tiny Philippine Pointed rice shells. My plan is to use all but the trivia as flower centers. I’m thinking the trivia may go on a vine. Again, I selected colors that will compliment the Cameo. 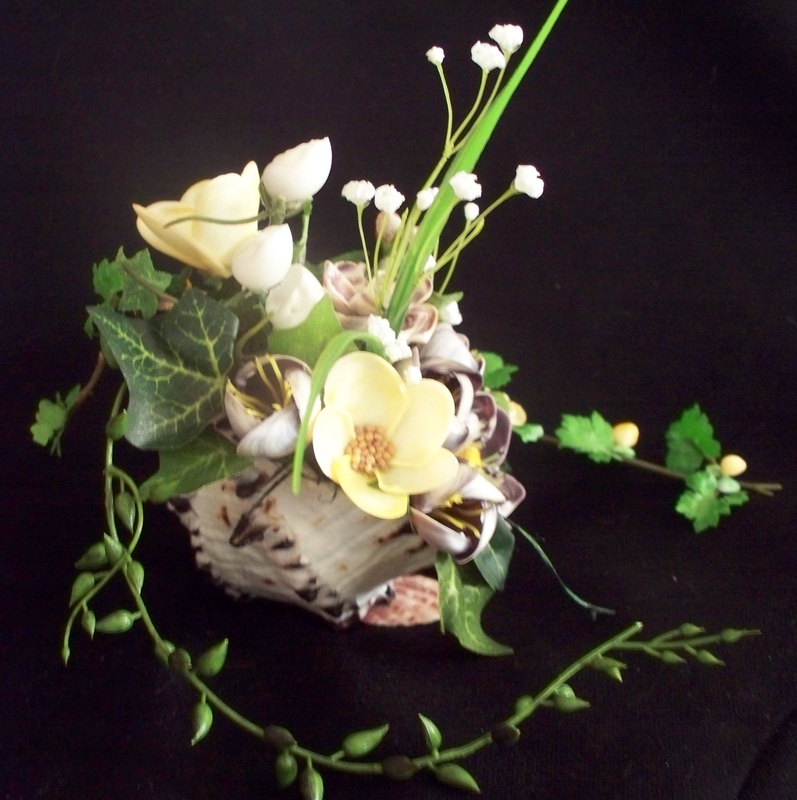 My choice of greenery is very similar to the Murex arrangement. 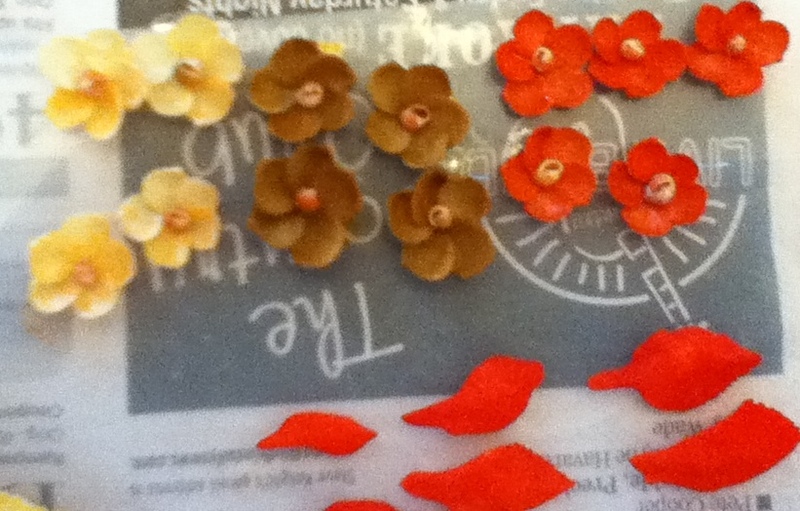 In addition I have a stalk of dried red leather and tiny artificial yellow flowers. For the vine there is a piece of wood vine. Again, I’m not sure yet exactly how much I will need to complete this art piece. On the lower left side of the picture you can see the flower bottoms. 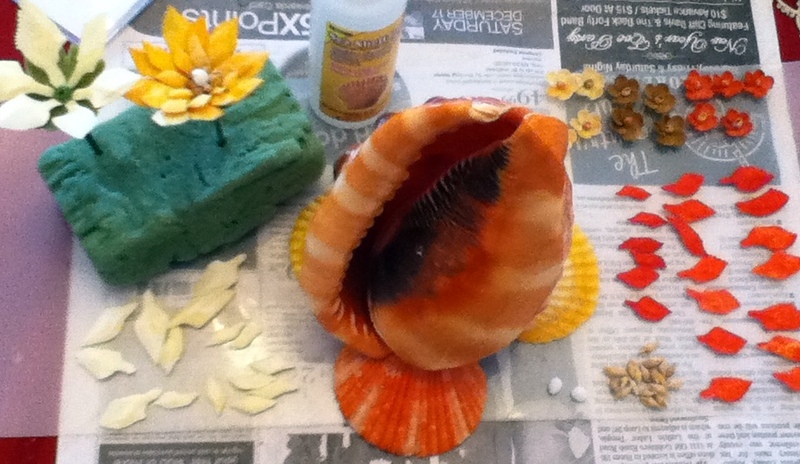 I plan on trying Bond’s Seashell glue, but I may need to resort to the hot glue gun. Either way, I’ll post the method. Well it has been a few crazy weeks. Between illness, a new little dog, family, a cancer scare, and the holidays, I totally lost sight of my art and blog posts. Plus I guess I should admit to an electronics fascination. I have a new iPod and the new Nook tablet. The month of December had a lot of hours spent playing with those! But I think I have caught up to myself. I’m grateful to still have readers and I appreciate all those who have subscribed. I am back on track and am eager to work on some new designs. As I mentioned before, clicking on the pictures will enlarge the image. 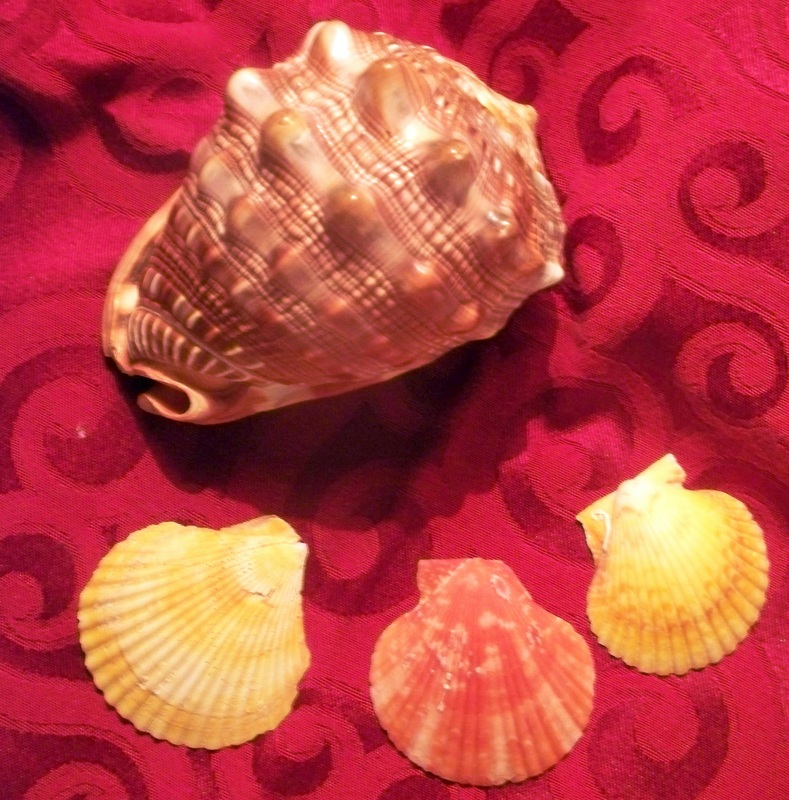 While sorting through shells I was listing in my online shop, I found a few larger shells. 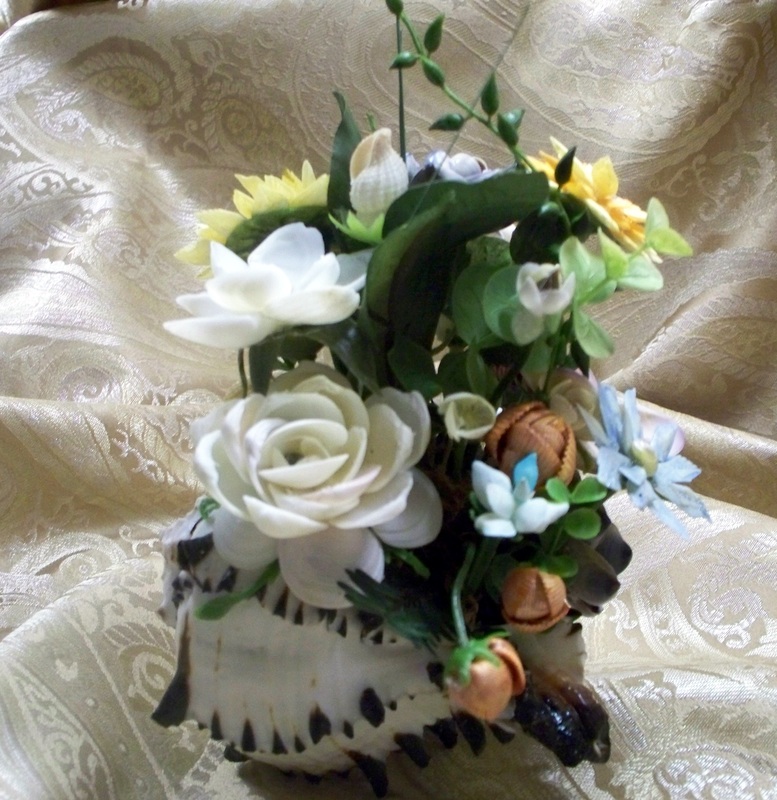 It’s been a while since I made a flower arrangement using these shells as the vase. I have a brown and orange cameo, a couple of cones, a large abalone, and a few others. I also want to do finish my wood and rock project. The project in this post will be using a large black and white murex. This is one of my favorite shells. 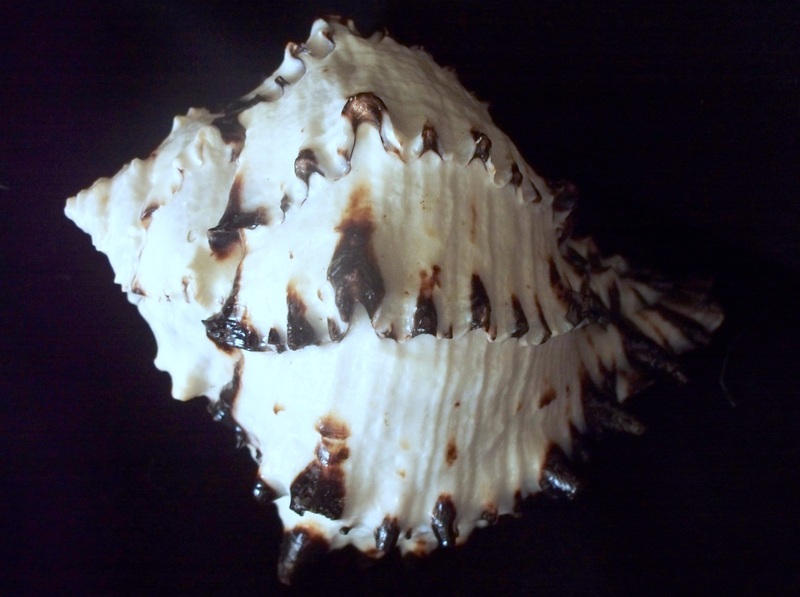 I like the texture and the sheen of the shell. All the little bumps and points have that lovely dark color. 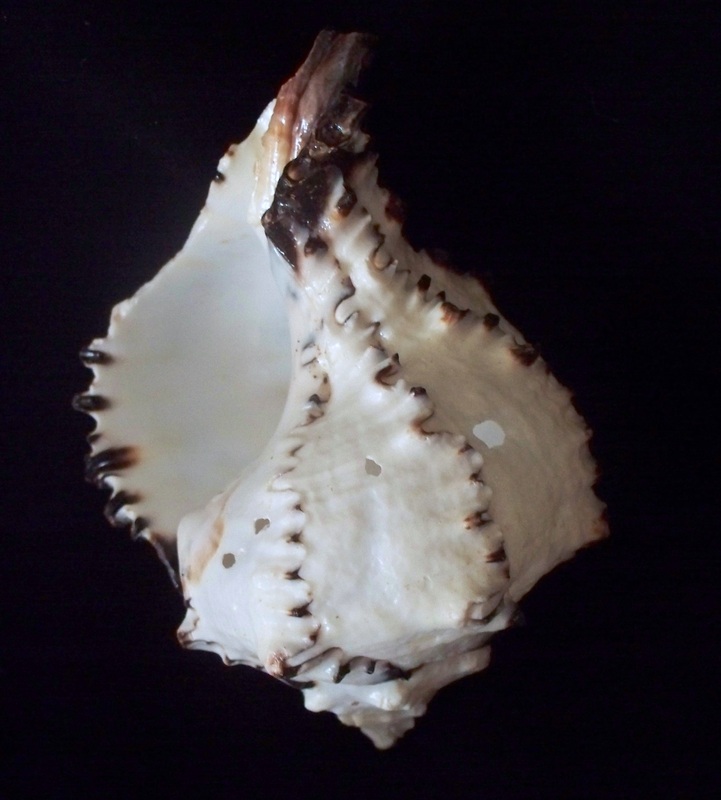 Even just sitting on the shelf as a specimen shell, the murex is eye-catching. The opening is smooth and glossy. There are a couple of flaws, however, on the front of my shell. Four tiny holes mar the perfection. If you have a shell similar to this, it really isn’t a problem. Use it to your advantage. Flowering vines can drape over the holes. Leaves can cover the flaws. If the hole was larger, you could make it part of the design by having the flowers ‘bloom’ through the hole. 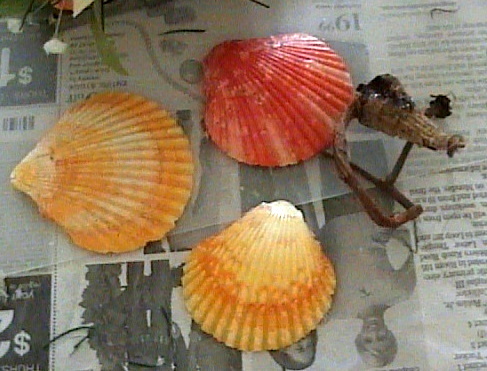 I plan on standing the shell on end as pictured for the arrangement. The following two pictures are a murex design I did a couple of years ago. That murex was much larger. For that design, I laid the shell on its side because I felt it would be more stable. Whenever I start a design, I pick up anything that grabs my eye. I may or may not use it. I already had a few flowers made, so my project time will be considerably shorter. I decided on a purple-ish color scheme, using yellow and white flowers for contrast. 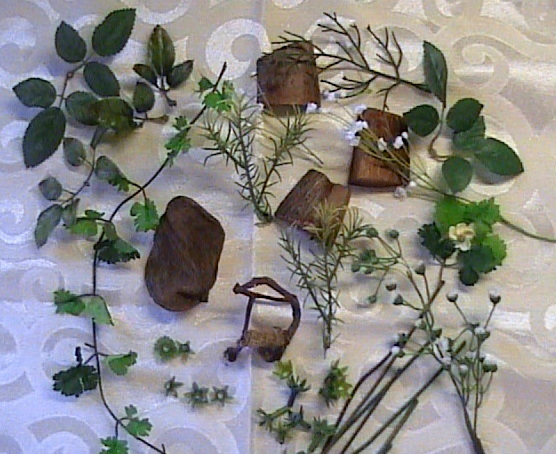 For greenery, there are small silk leaves and tiny white silk flowers. I use whatever material that catches my eye. 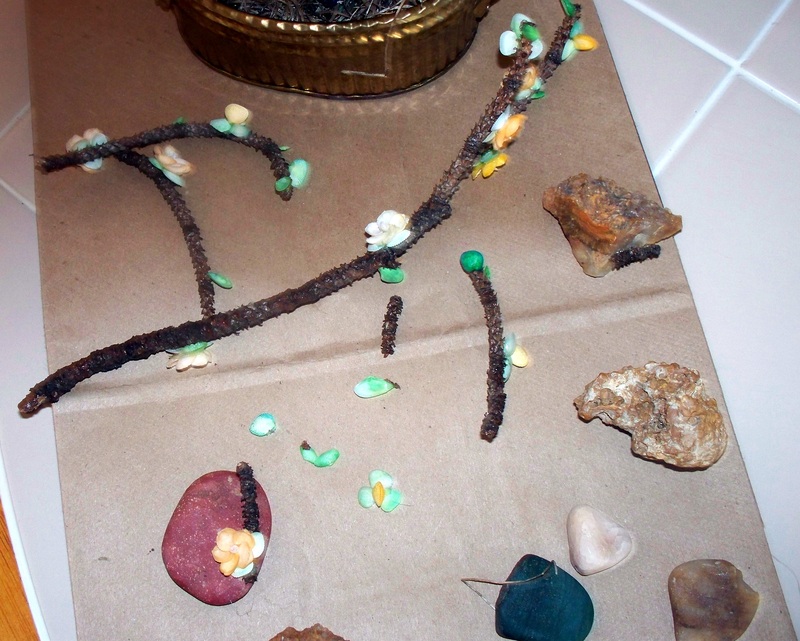 You can use feathers, sticks, pine cones, dried leaves. I like the wood potpourri pieces, also. They add a bit of character and uniqueness but I let them air out so the scent will dissipate before use. As I said, I gather more than I will need. Nothing frustrates me more than having to stop and find greenery or make flowers. In addition, the left over flowers will be saved for future designs. Sometimes I spend days just making a variety of flowers. But everyone works differently. 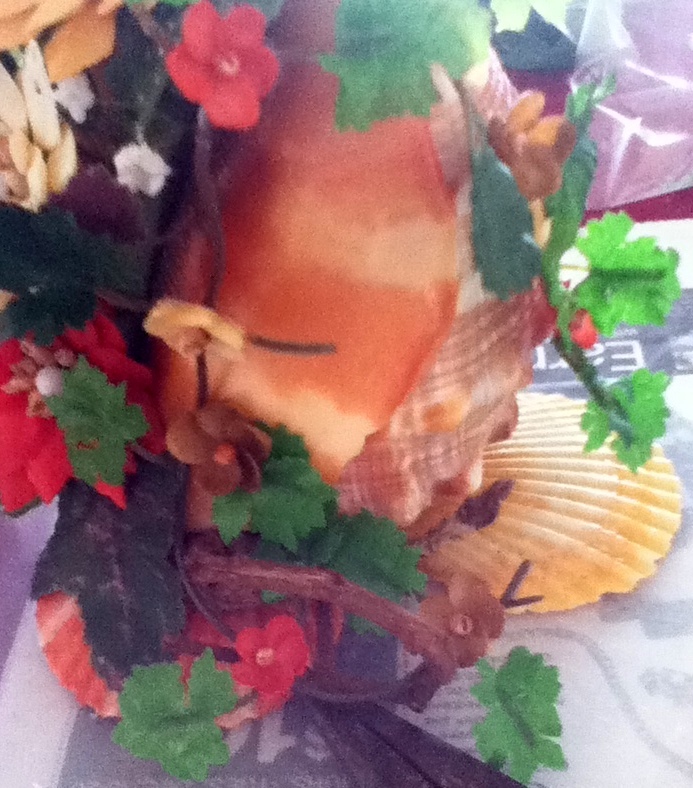 I’m using floral oasis in the shell. I’ve used Styrofoam but I like the oasis better. The texture is softer, less brittle than Styrofoam. 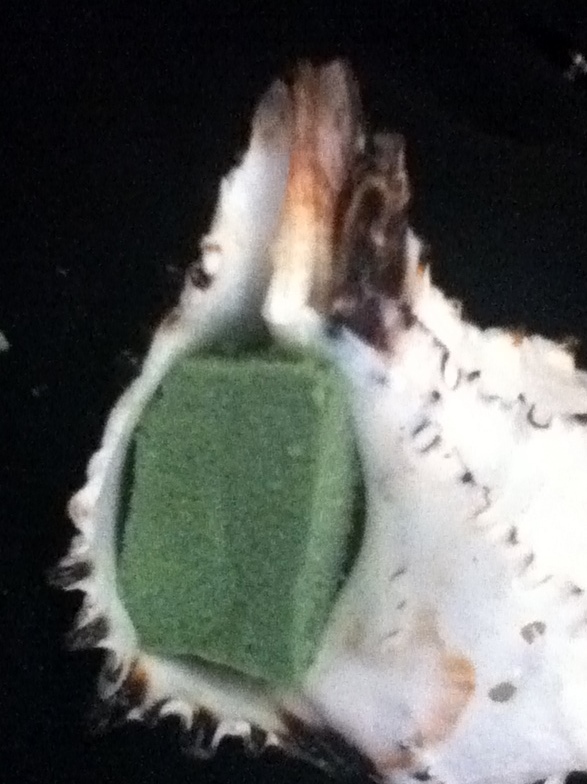 After pressing the piece of oasis firmly into the shell opening, I trim it back. You don’t want it exposed. I don’t toss the trimmings away, though, until I’m completely finished with the arrangement. There are small gaps that may need a small piece. I do not add the moss yet, I want to play around with design. In my supplies, I have three types of moss; a spongy green moss, dried grey moss, and an artificial green type. The last is what I am using here. Except for two flowers, there are no stems attached, yet. I don’t want too many holes in the oasis. Carefully placing the flowers, I work out the design. I choose the leaves I want to use. When using multiples of the same flower, make sure you use matching leaves. 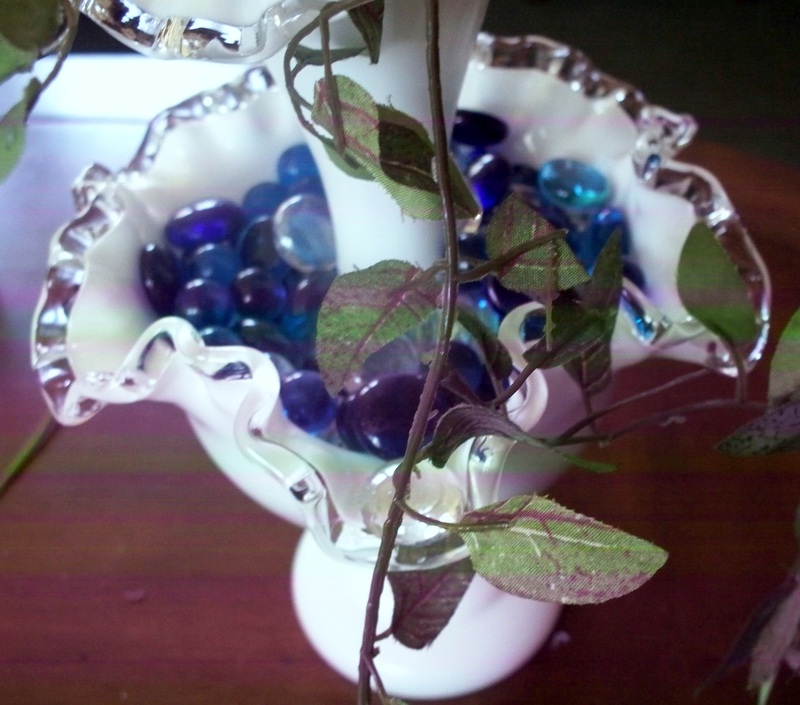 I once made some violet roses then discovered the leaves didn’t match. 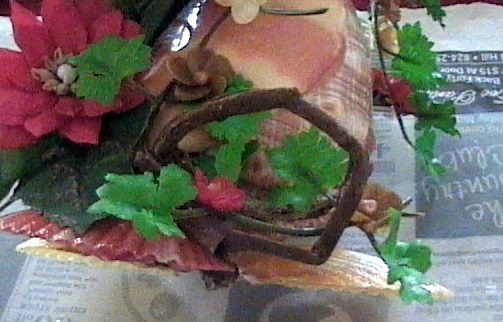 Additionally, my creation has to allow for a vine to naturally drape over the four tiny holes. 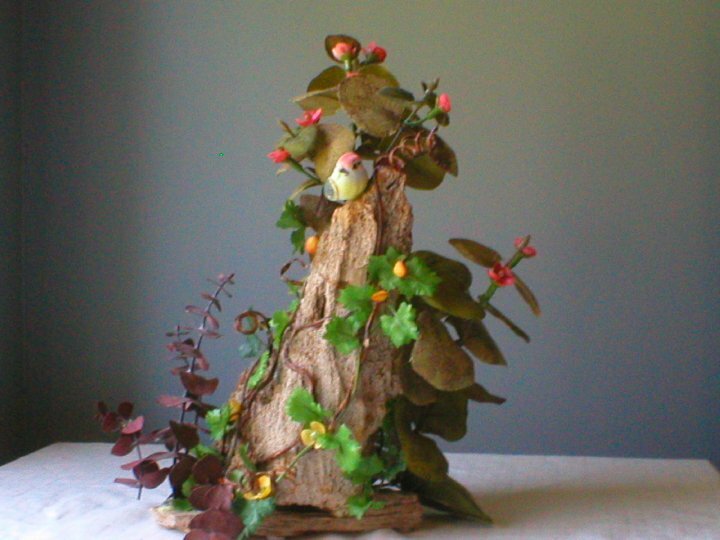 After I’m satisfied with the design, I’ll glue short stems into the flower base and attach leaves.The moss will be laid over the oasis before inserting the flower stems. Prior to placing the flowers, I’ll trim the wire stems to size. I want the stem long enough to go deep into the oasis but still be above the moss. 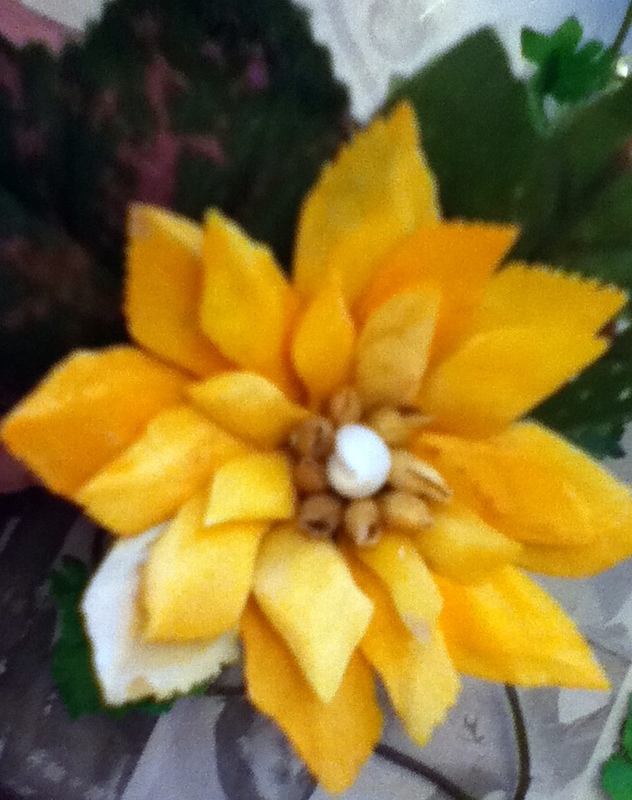 The leaves are glued beneath the flower. 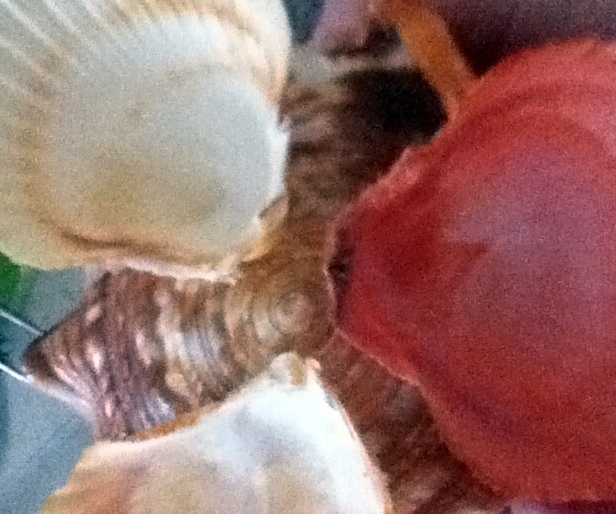 In the picture above, you can see a small pectin shell. It isn’t needed for stability, but I wanted the appearance of a ‘stand’. I made another arrangement with a murex once and every time someone picked it up, it was replaced it a different position. So here is the finished piece. I think it turned out exactly as I envisioned. The purple and yellow pair up beautifully. I covered a couple of the holes, but since they are there naturally, I didn’t stress too much. The holes don’t seem to distract from the overall design. I’ll start the next arrangement using the orange and brown cameo. 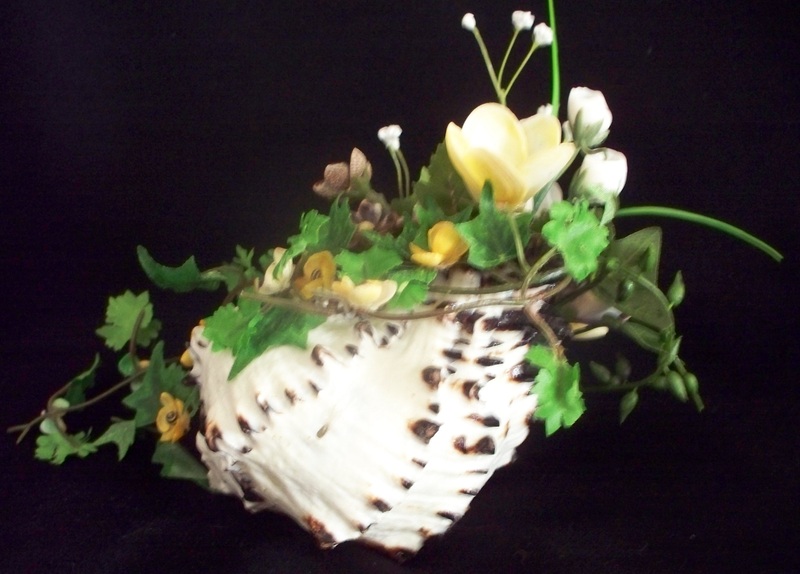 The flowers will be gar scales and cup shells. Can’t wait to get started! Overall, the damage was rather minimal. 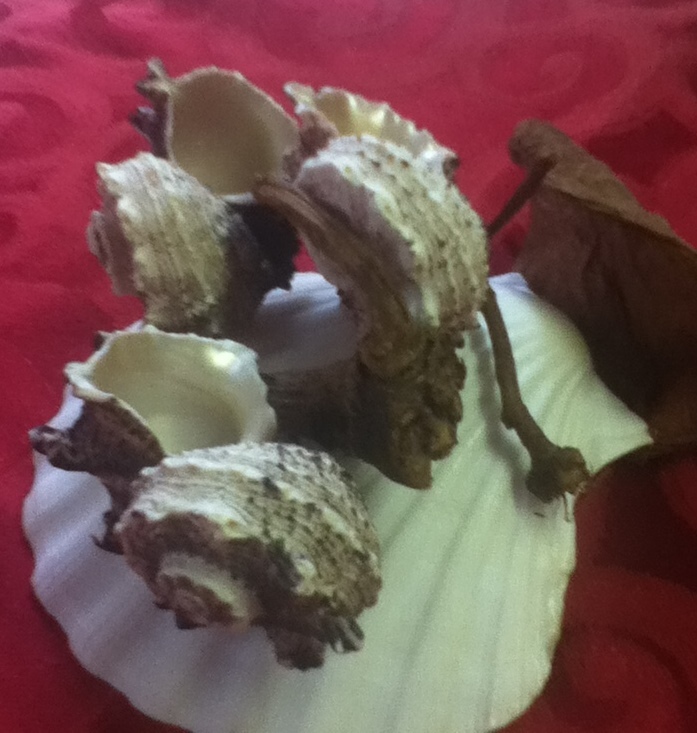 Some branches were broke off but, for the most part, the shell flowers were intact and the shell leaves were undamaged. 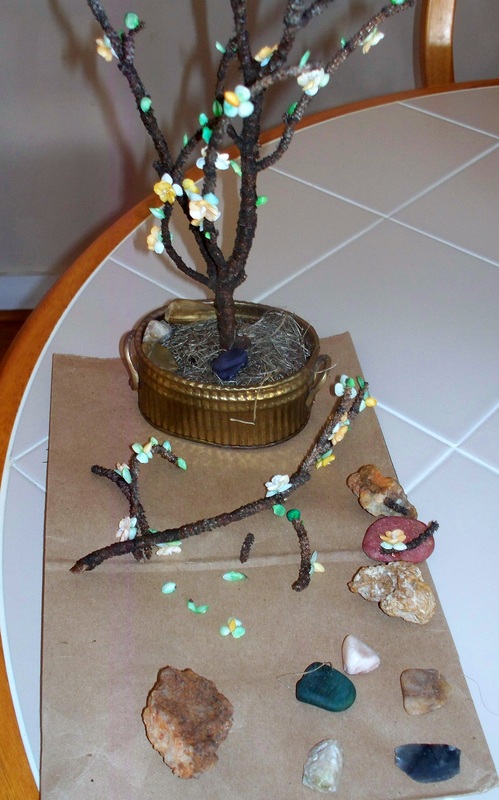 Using generous portions of glue, I placed the branches along the base. I thought that made more sense. The glue would show right where the repairs were made. Like the first time, I didn’t glue the rocks. This way, if I change my mind and want to try something else with the tree, I can make the transition smoothly. Needless to say, I did not put it back on the mantel! them to the vine. 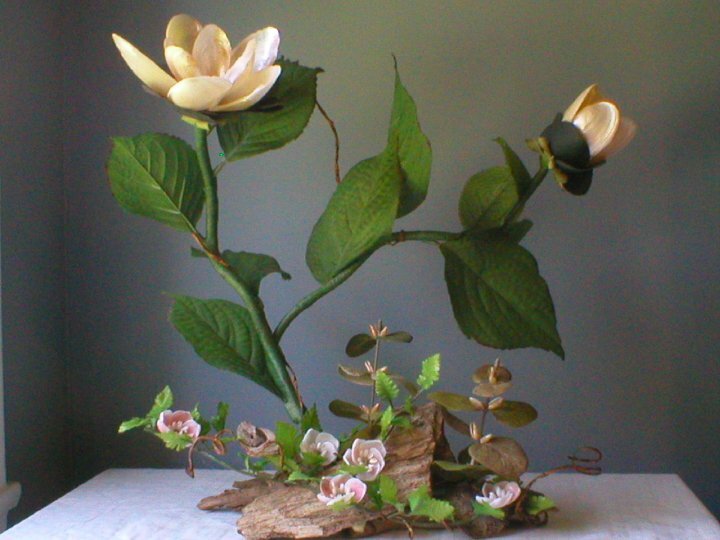 When you make flowers like this, sometimes you have a little dried over glue. The glue dries clear so I couldn’t get a picture, but I’m sure you know what I mean. Using manicure scissors, I trim the glue even with the shells. It’s very easy to trim the excess off. 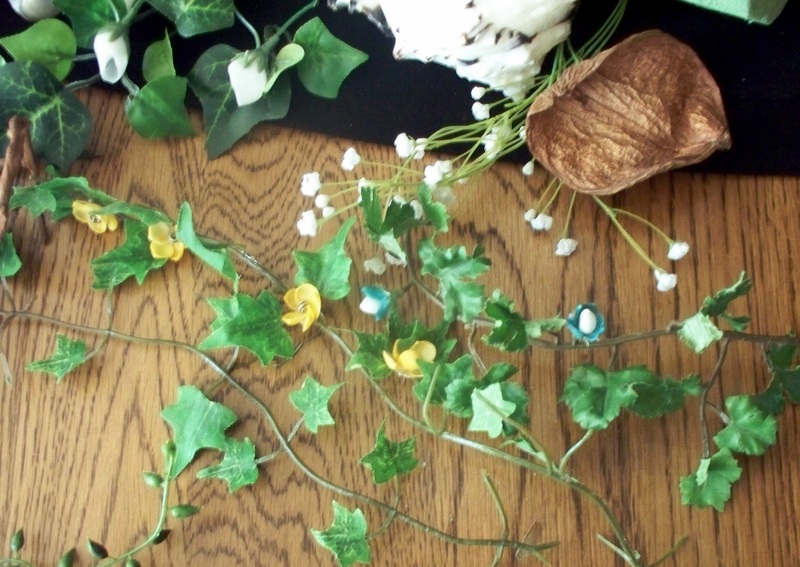 Putting a drop of glue in the center of the leaves, I pressed the flowers randomly on the vines. Since it is plastic, you’ll have to hold it gently, but firmly until the glue becomes tacky and sticks. I rather like the delicate look of the vines. 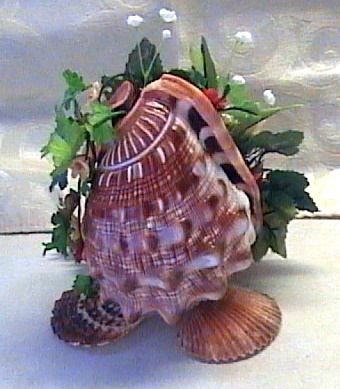 The soft red tones of the shells looks natural against the greenery. 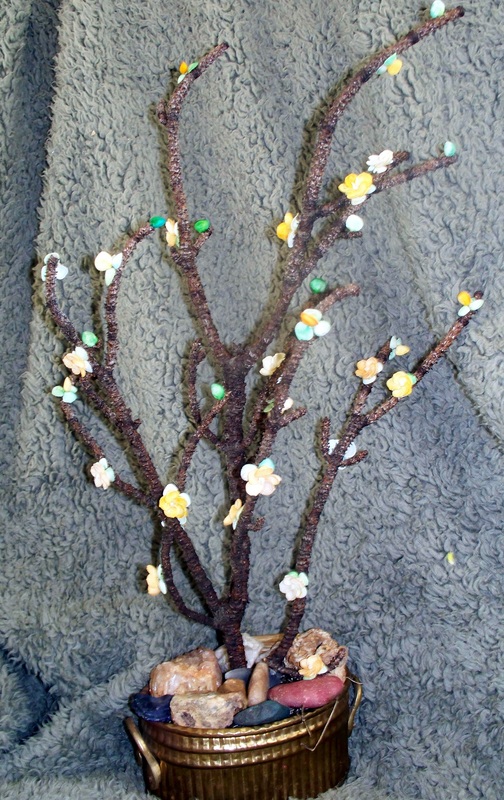 I didn’t want to throw the balance off too much so I just used three curly twigs as a contrast. I’d be happy to hear any suggestions for improving this piece. I knew what I wanted to achieve with the vines but I was unsure how to treat the top. I already have plans for my next art piece. It seems like my ideas are stacking up quicker than I have time to finish. 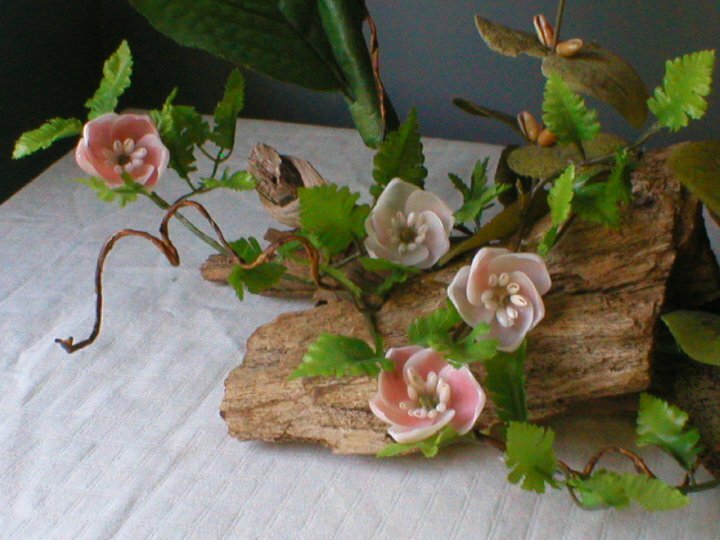 I was given a vine with silk roses for use in my projects. I had already found an interesting piece of pecan wood. Together, they are perfect. 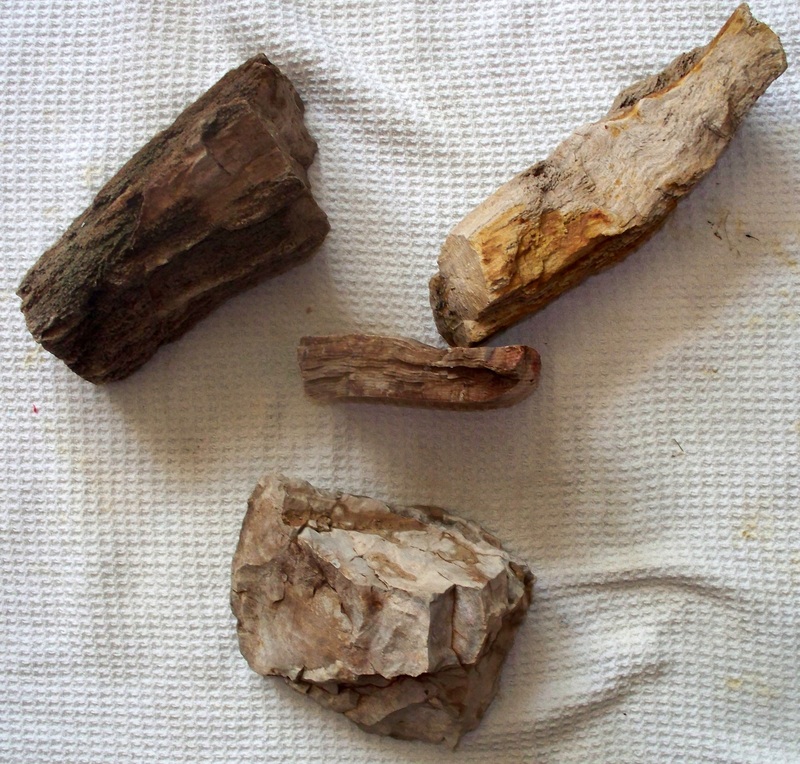 In my collection of rocks, I found three driftwood pieces and some other kind of rock. I have no clue what kind of rock it is, I just liked the way it looked. Driftwood is beautiful; I love it. When you think of how old it is and what forces of nature it took to petrify it…Well I find it amazing. The character is impressive. I have a small 5 X 5 plank. Drilling a hole through it, I’m going to attach the stick to it with a large screw. This isn’t to actually hold, but to keep it stable until I glue the rocks around it. My goal is to make it look like the stick grew up through the rocks. I have some artificial green moss that I will be using around the base. But that is all I am going to say until the next post. I wanted to show a couple of arrangements I’ve done. 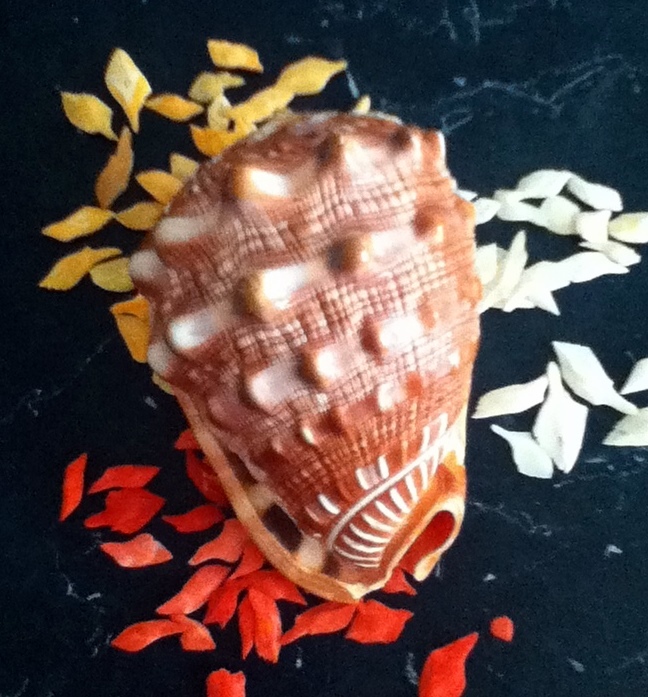 In the time I’ve done shell art, I’ve learned a lot, mostly about letting your imagination loose. 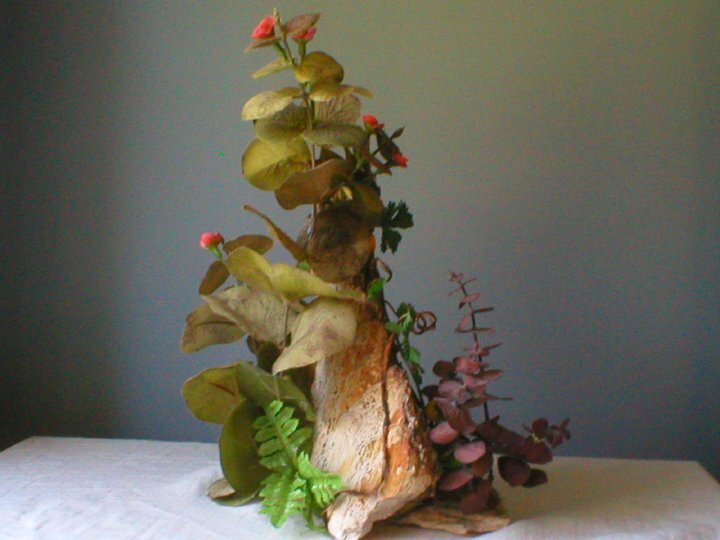 For this arrangement, I used sandstone to form the base. I chose pink tellins for the flowers. 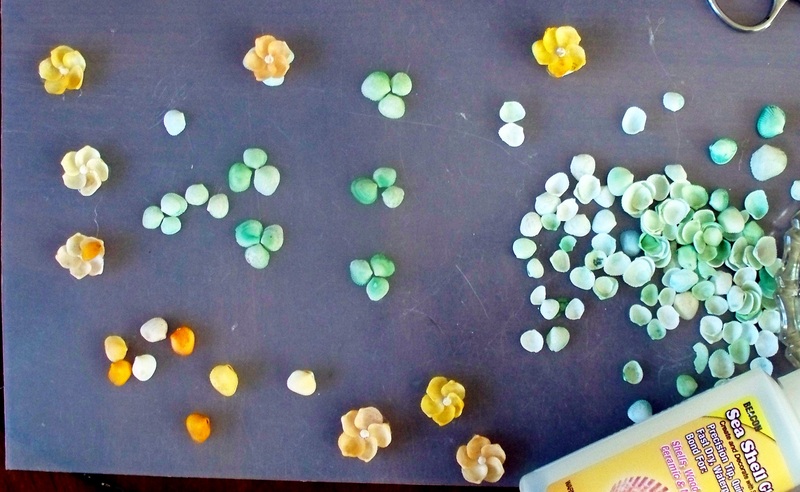 The shells just make beautiful, delicate flowers. 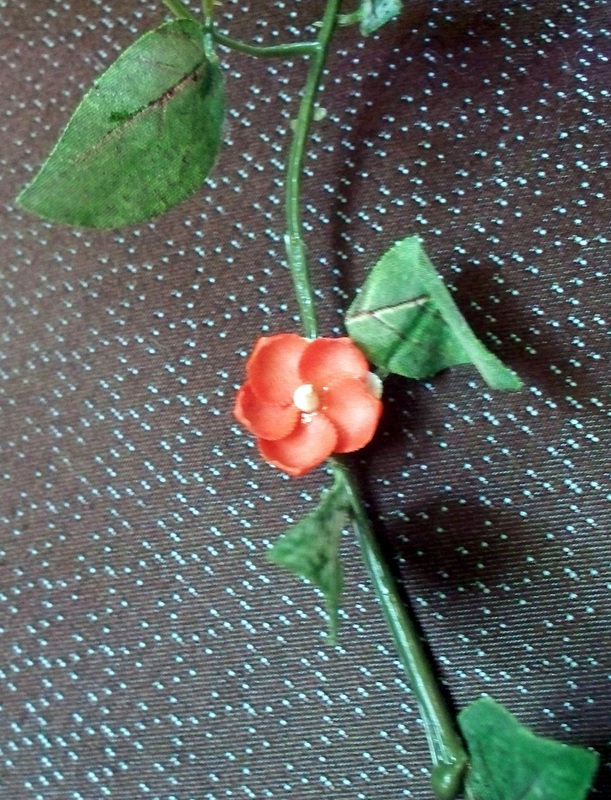 After the larger, lotus type flowers were glued in place, I wove a small vine. It was covered with purple wing shell flowers. When the arrangement was completed, I surprised and impressed. I didn’t know I had any kind of artistic talent. So I made another using different shells and design. This was my favorite piece of driftwood. 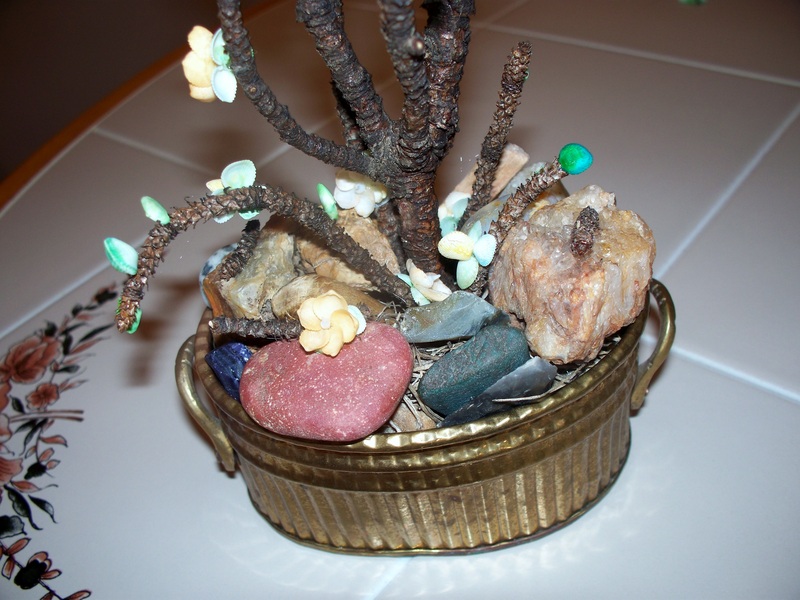 Using Gorilla glue, I used flatter rocks for balance and stability. On the side of the petrified wood was what appeared to be the path of a vine. So my vine followed that path. The rock is beautiful and looks like a miniature mountain. I tried to use my greenery to look like a forest. Whenever I have to move it to dust, I forget the bird and knock it off. I think I’ve glued that bird four or five times now. While living in Washington, I got to spend a lot of time on the coast. You can find the most amazing pieces of driftwood. I just loved this piece of wood and held onto it for over twenty years. When I started this design, I dug it out because I wanted to use it. 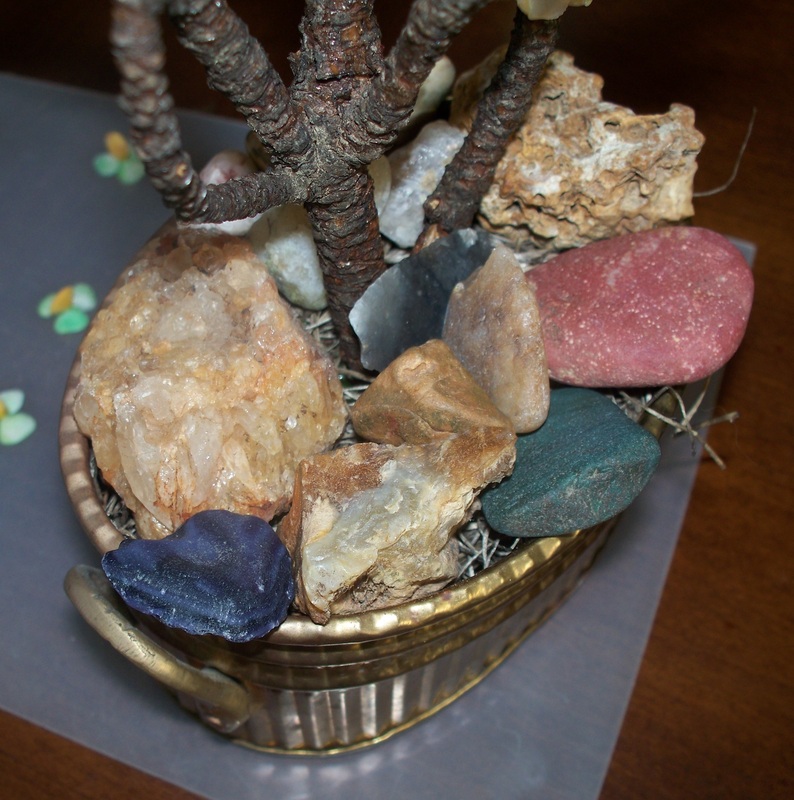 Using Gorilla glue and a couple smaller rocks (sandstone and petrified wood) I made the base. I wanted the plant to ‘grow out’ of the rock. 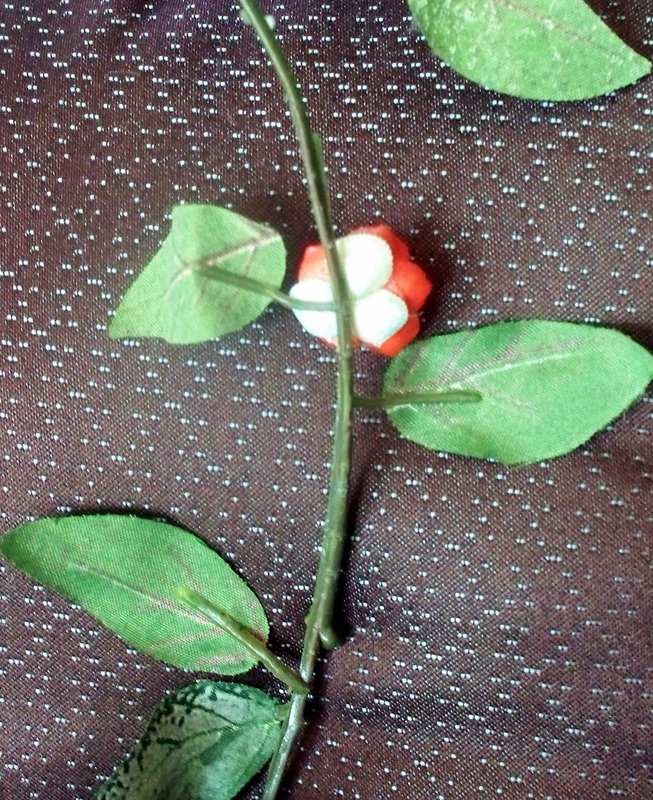 After the glue dried I attached a vine with rose cup roses. The leaves are almost fern-like. 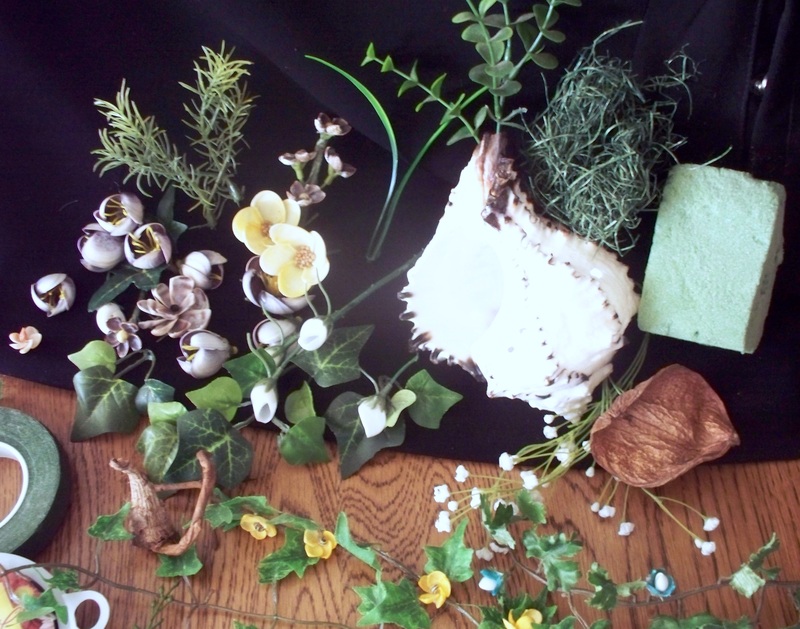 For contrast, I used some silk plants with round brownish-green leaves. Brown Hawaiian Rice shells are placed in the leaf joints. With nearly any natural item, wood, rock, etc. Flower arrangements don’t have to stay in vases. 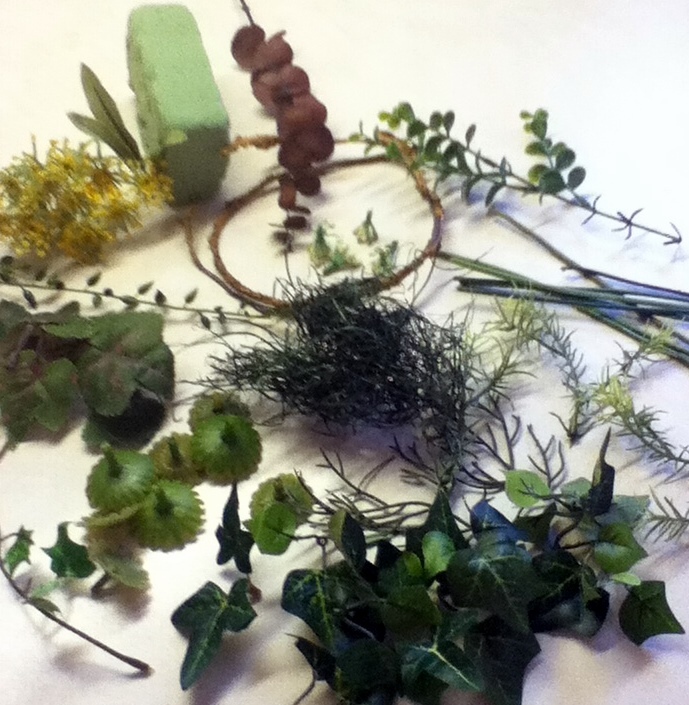 Make a garden. Let your imagination go and create. It has been several days since I started Part 2. There was a fatality in my project. I’m going to finish writing about my progress so you can see where my idea was going. But sadly, the art piece came to an end. The epergne had an accident. OK, I had the accident. I cannot believe I was so clumsy. My design, I feel, was very good so I am looking for a replacement. In the meantime, I have taken my idea and transferred it to a different vase. 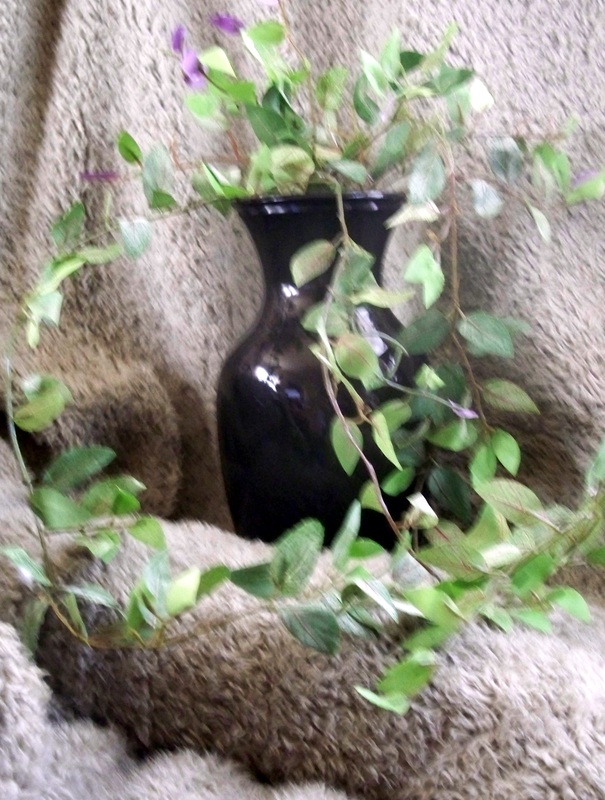 This time I am using a heavy black jasper vase. The flowering vine part will remain the same but I think I may need to add something for height. I’ve also been working on a second piece. One day while I was outside, I found this interesting small pine branch. Of course my imagination immediately took over and I could see a flowering tree. I am including that art piece in this part. On a side note, I would not recommend pine in this type of arrangement. 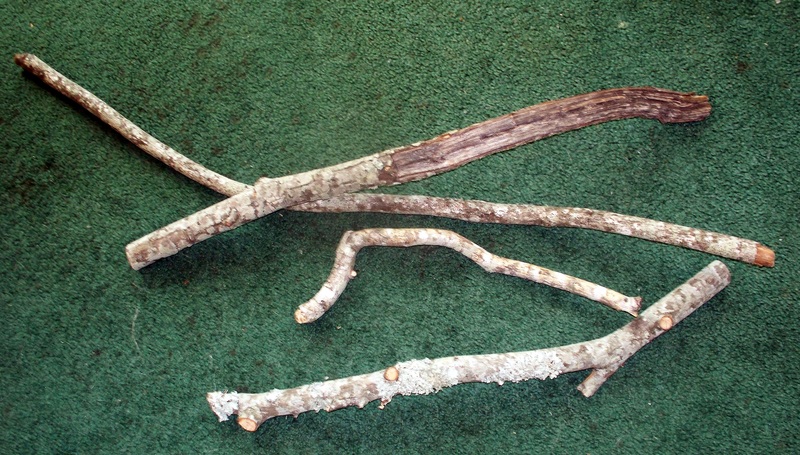 It is a soft wood and the branch/twig is very brittle. I’ve already glued one part back one. So here is where I left off before I was so careless. I sat staring at the epergne last night and I figured out what design I wanted to follow. At first, I thought of some sort of bushy greenery around the base but then something my son said popped in my mind. He said the epergne looked like am antique Greek or Roman vase. I immediately thought of a water fountain. With that thought the vision formed and I knew what direction I had to take. In the bottom level, I pictured water. 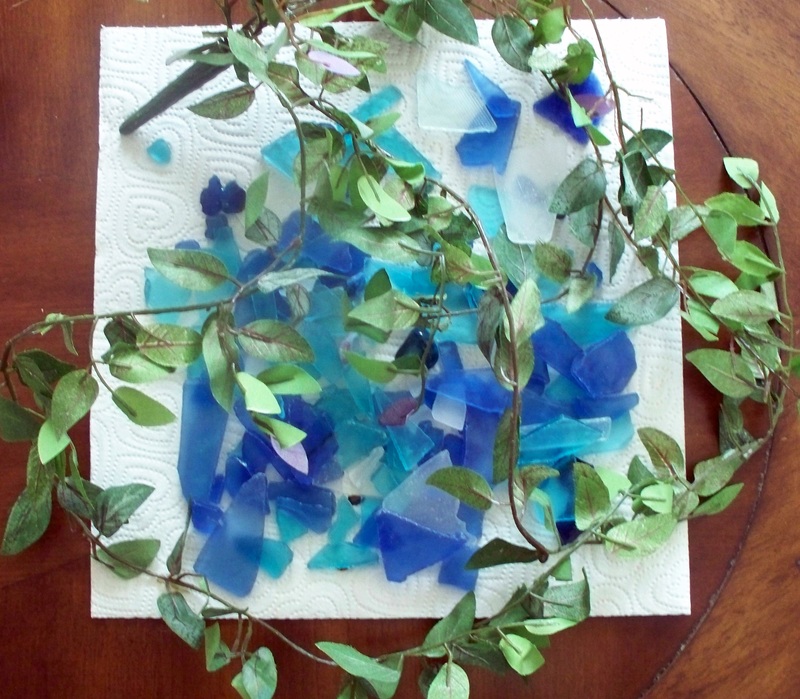 Rather than use real water that I would have to change often as well as color, I thought about blue glass. 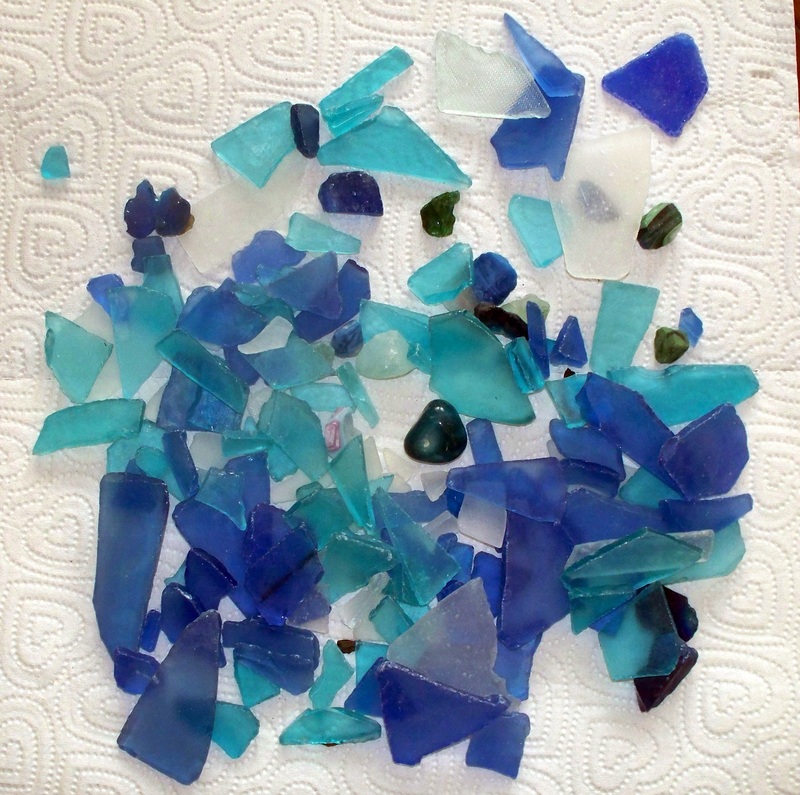 I have some tumbled glass in shades of blue and white and a friend gave me some polished glass. Both have the colors of water, however I think I like the glossy shine a little better. 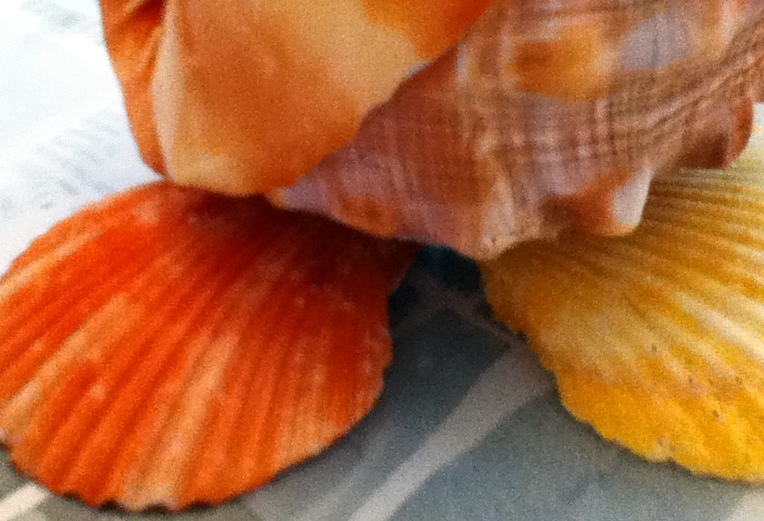 I picked dyed cup shells in shades of red, yellow and orange. 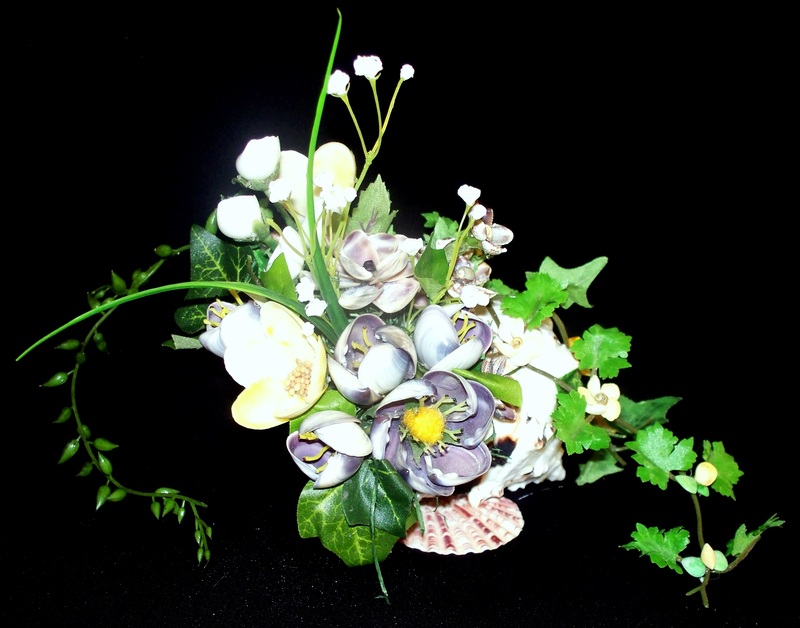 For the flower center I used very tiny whelks. 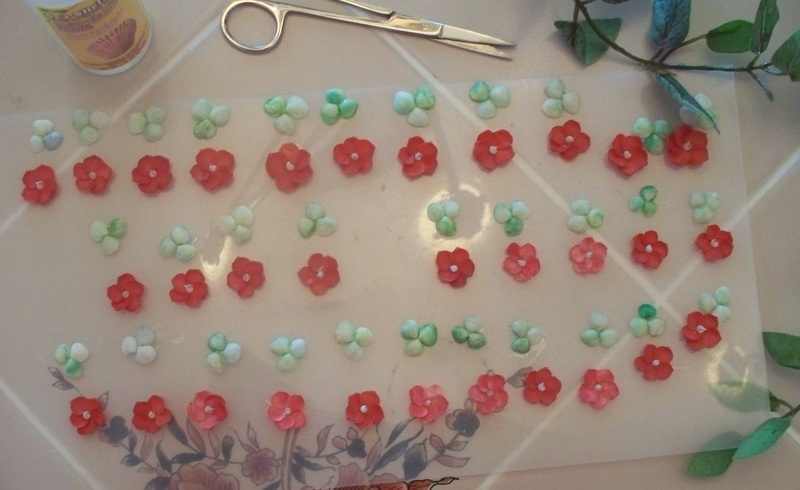 As I explained in the first part, I assembled the flowers on the poly sheet. I placed a dime and a penny next to the flowers for scale. After 24 hours, I gently lifted them off. I wrapped the stems with florist tape. This made one stem that was thicker and more stable. After gently pressing the vine in the top section, I put a small amount of moss around the taped wires to disguise them. A few, shorter vines stood straight up, the balance flowed over the side like a water fall. The greenery was perfect. And then…CRASH. Absolute dismay and shock. But after a few days, I got myself regrouped and started on the tree. When I am through with it, I still want to make flowers for the vine. 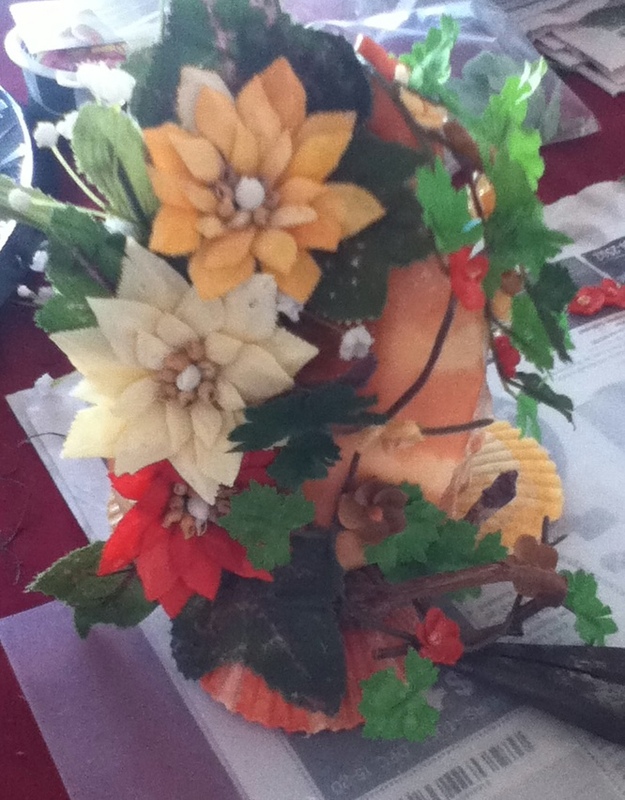 I reserved the red flowers from the batch I made. The red, green, and black will make a good artistic statement. I took the yellow and orange flowers for the tree. 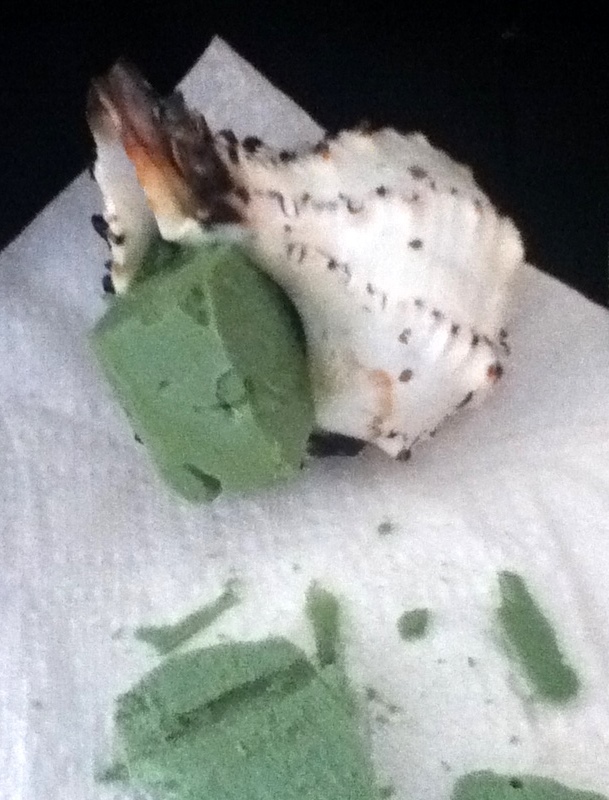 To cover the backs, I laid three dyed green cup shells together. 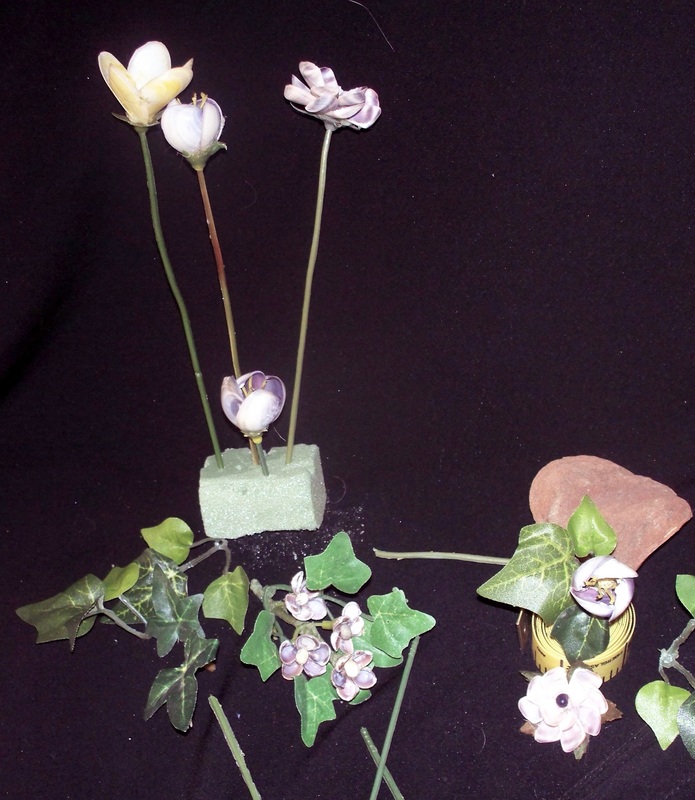 Putting a small dot of glue on the back of the flowers, I set them on the leaf trio. To simulate buds, I used unopened cup shells. 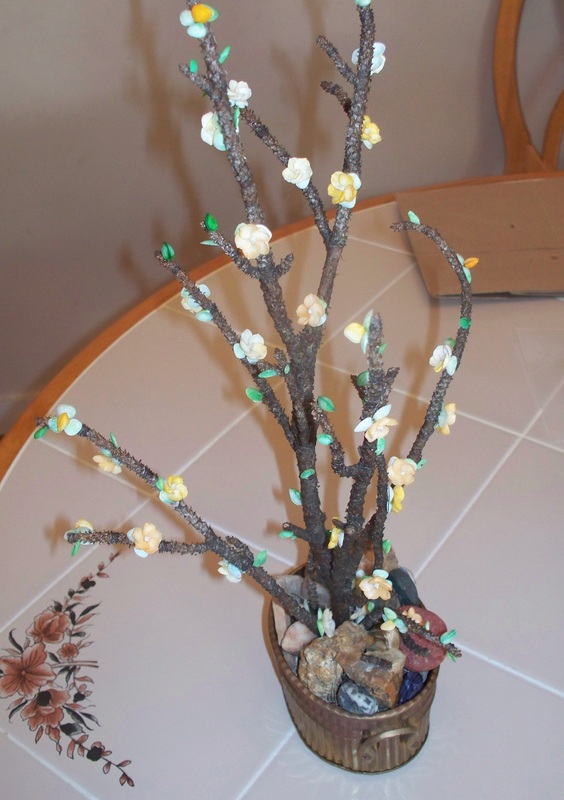 I also glued unopened dyed green cup shells on some of the branches. The new glue I found at Hobby Lobby is great. It glued rock to rock, the broken tree branch and it sets up a little quicker than the 527. On the branches, I held the flowers in place for several seconds before releasing them. After giving the glue a few minutes to become tacky, I carefully pressed the shells against the wood. I am so pleased with this glue. With both Tacky glue and 527, you couldn’t have done this. The tree isn’t quite finished. I think it needs a few leaves or buds, something. But for now, I’ve made a good start. 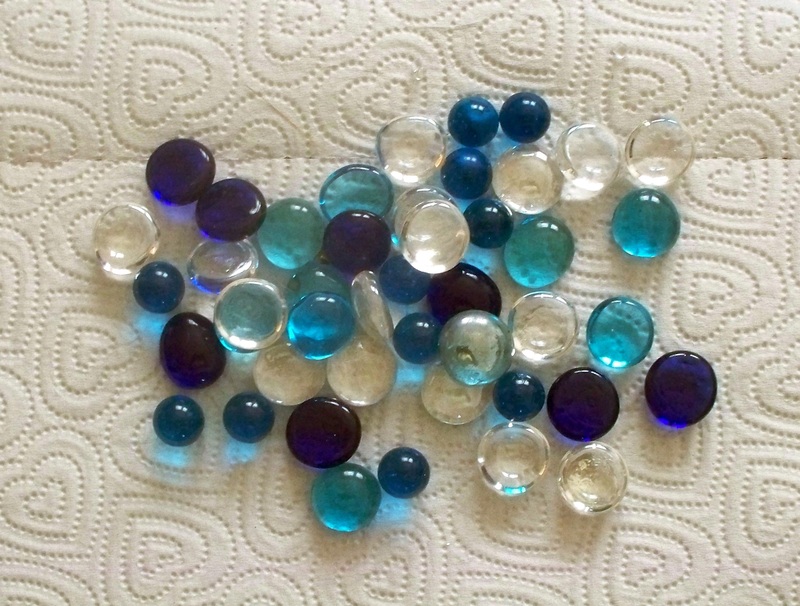 I have a large collection of semi precious rocks, all uncut and unpolished. 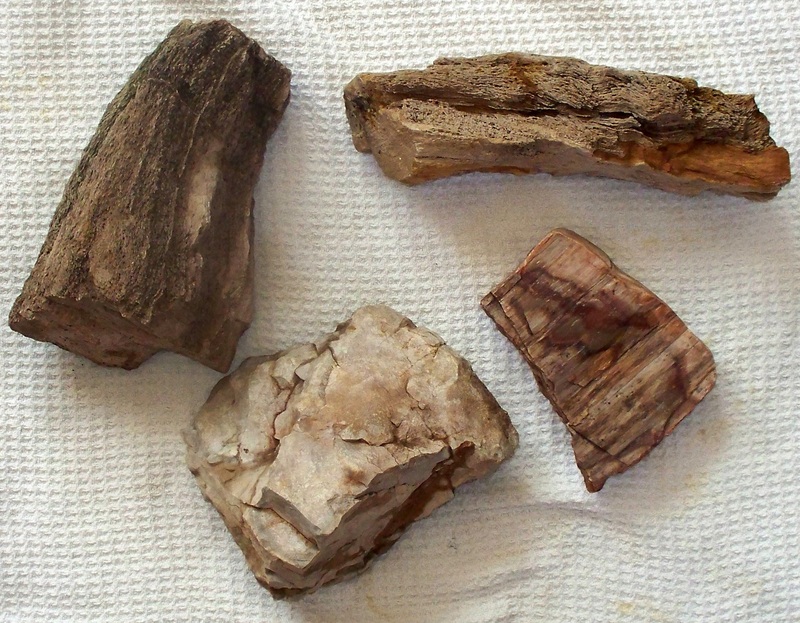 Mixed in are rocks and pebbles that I thought looked interesting as well as a few pieces of petrified wood. I selected a few to lay in the bottom of my arrangement for added weight. 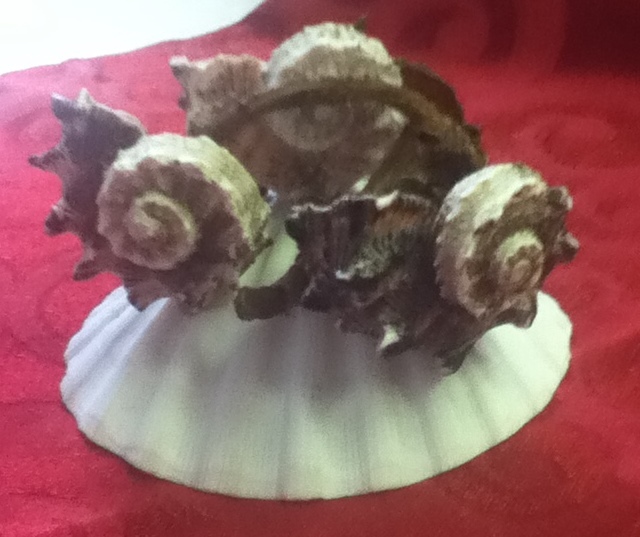 Even with shells, the small branch is very light, but so is the metal container. I like the way it looks, also. The rocks could be sprayed with shellac to bring out the hidden facets, but leaving them natural seems to suit this piece better. Before starting this to work with the pine branch, I did spray it with polyurethane to seal in what little moisture was left. As I said earlier, pine isn’t the ideal choice for this. But since it’s purely for me, it’s OK. Nor is it completely finished. It really needs more flowers and some leaves. The container is just an old brass covered tin pot that once held silk flowers. I didn’t even try to clean it up. Altogether, it’s very rustic.